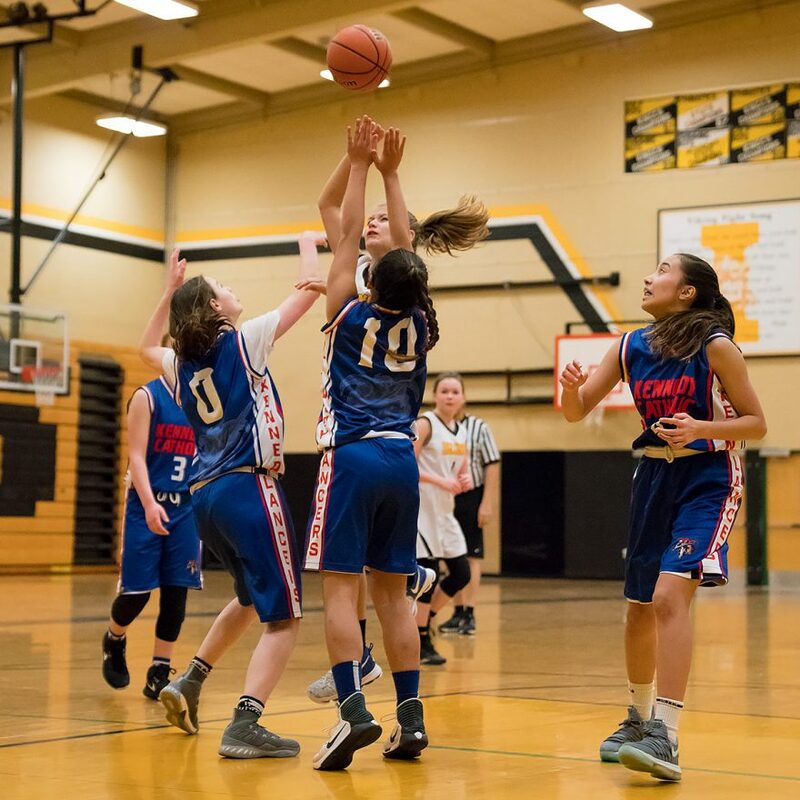 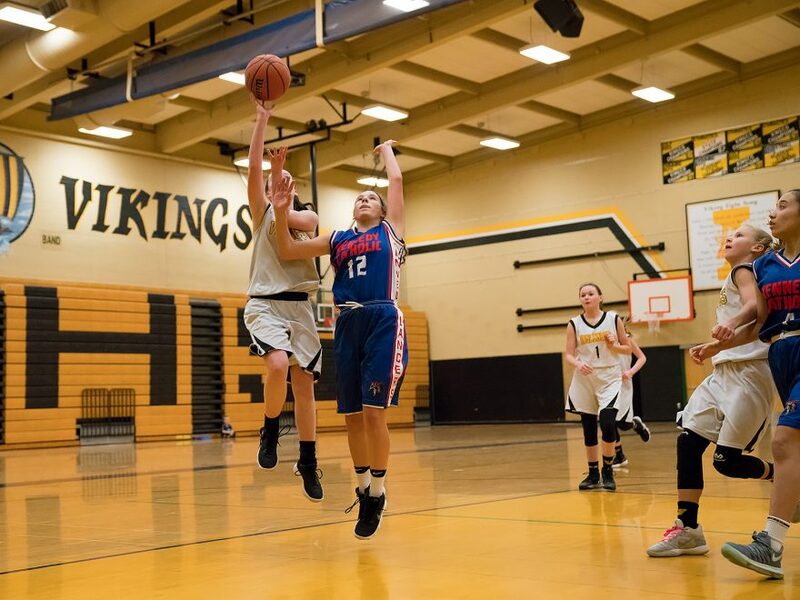 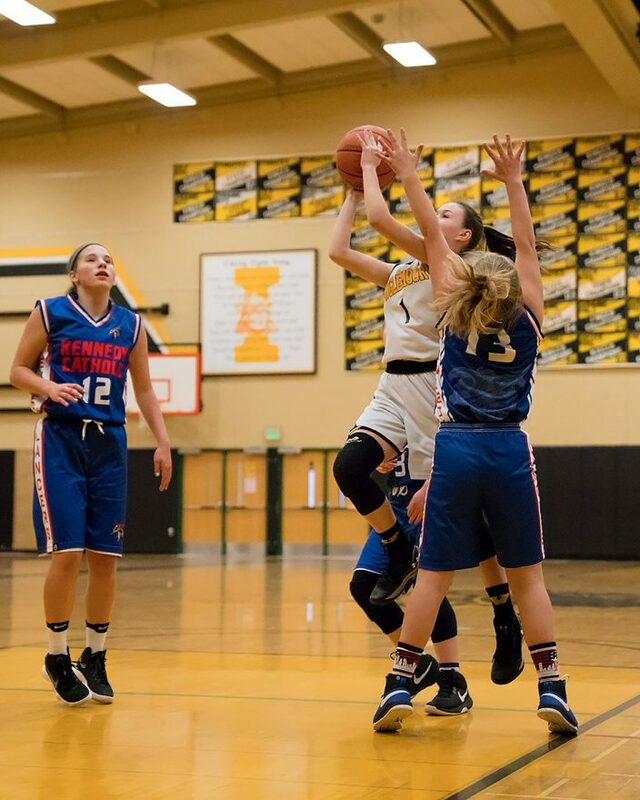 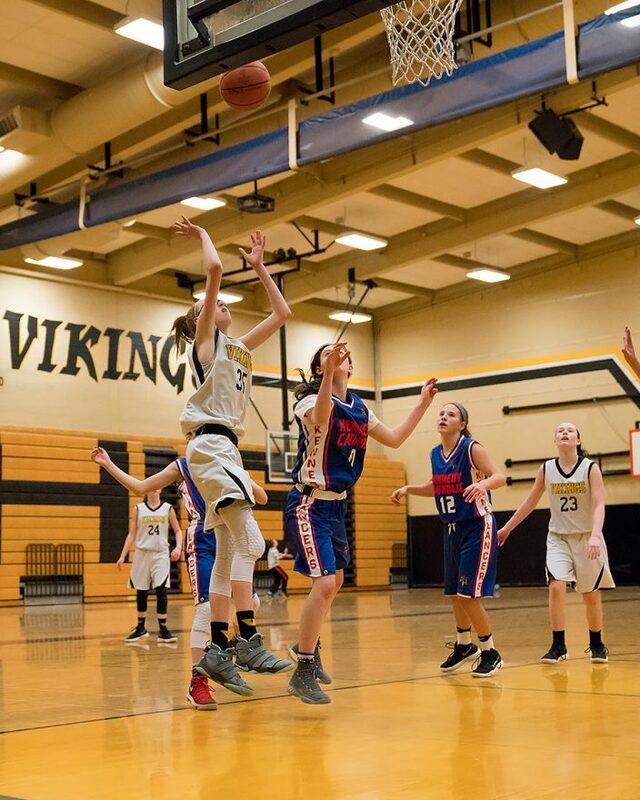 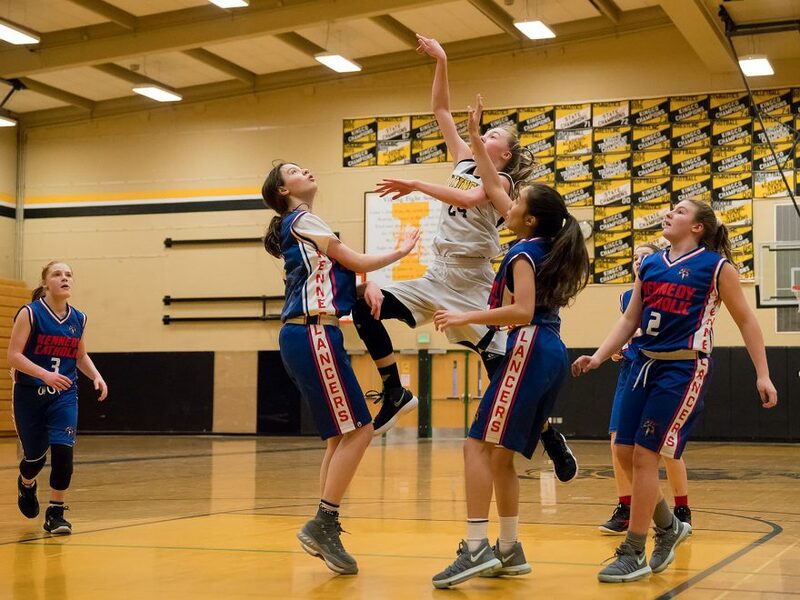 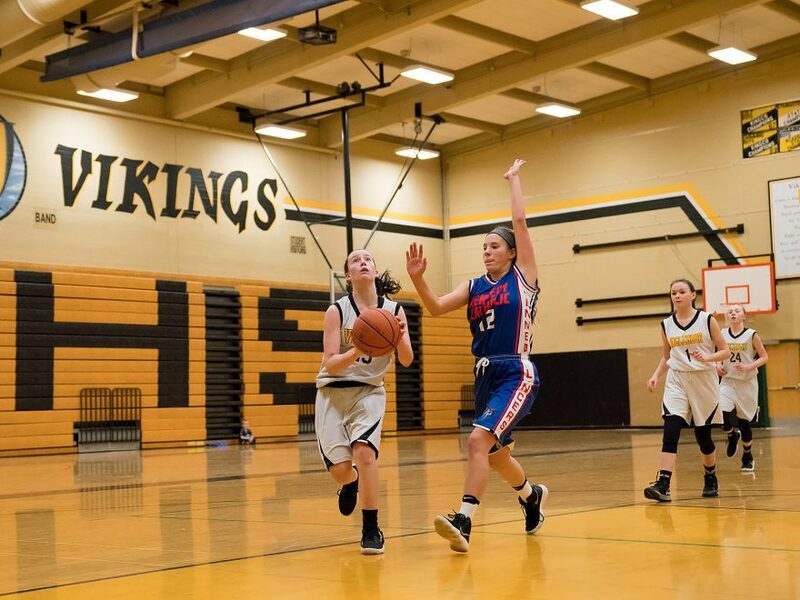 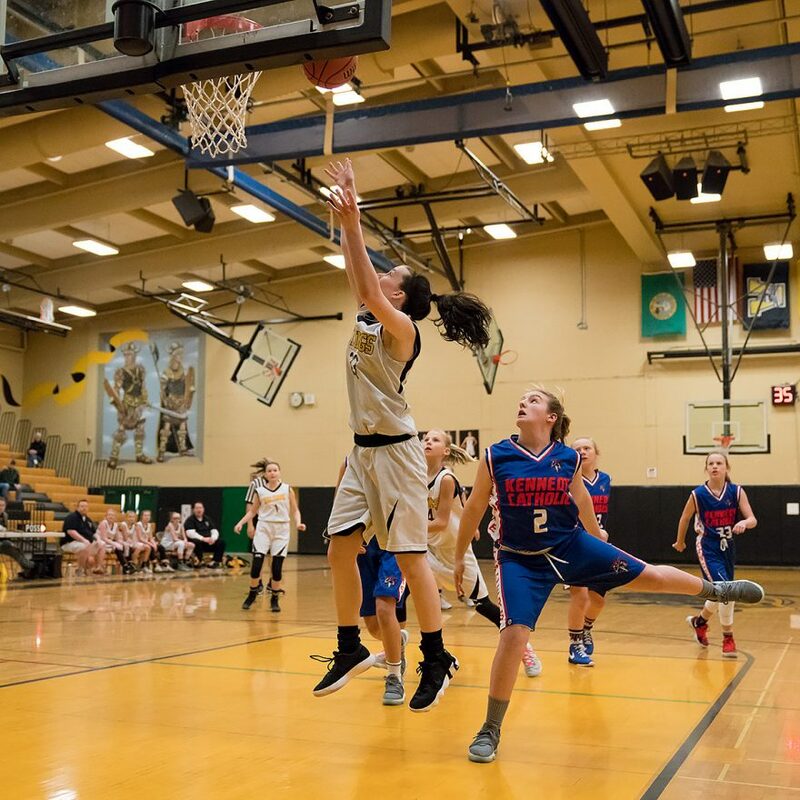 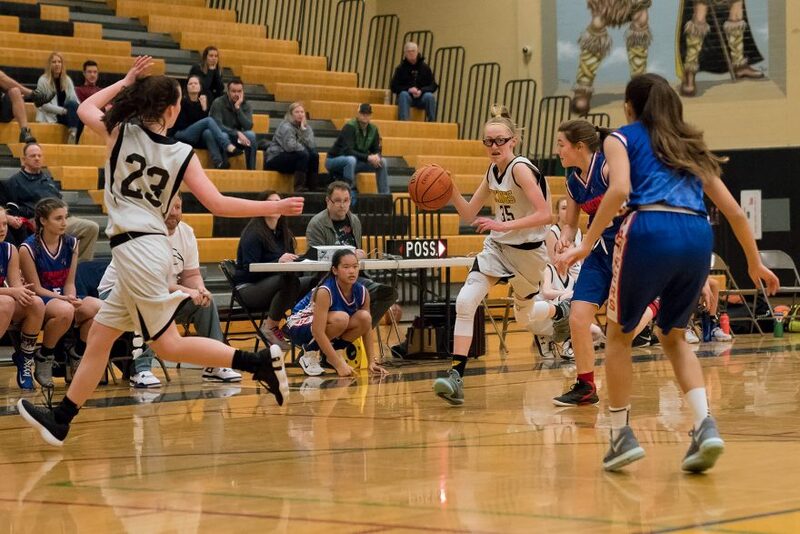 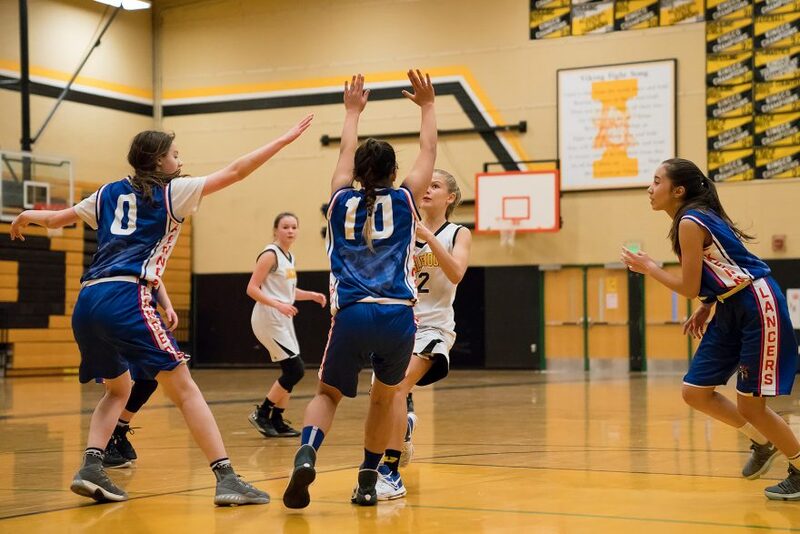 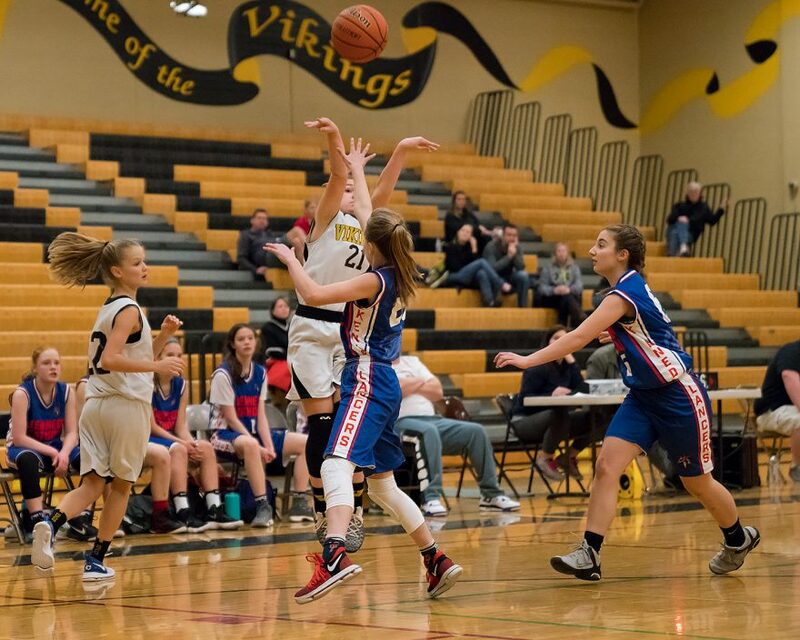 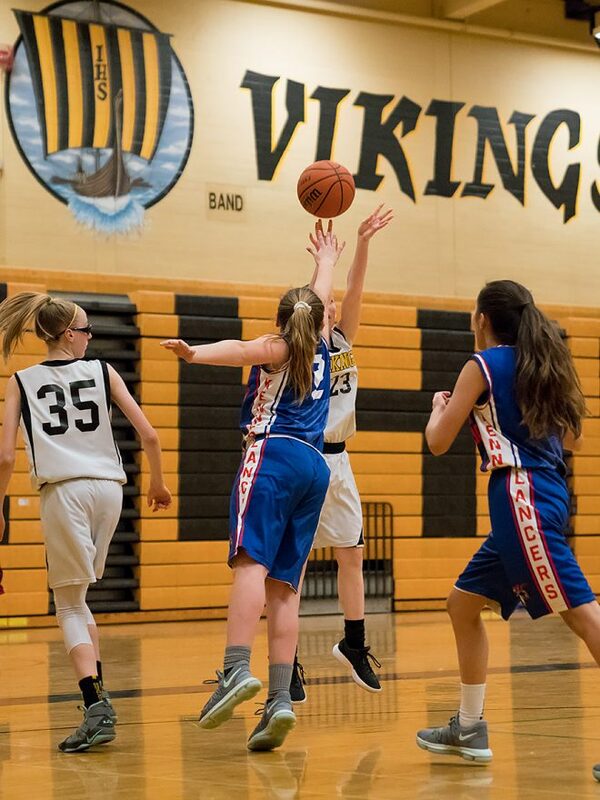 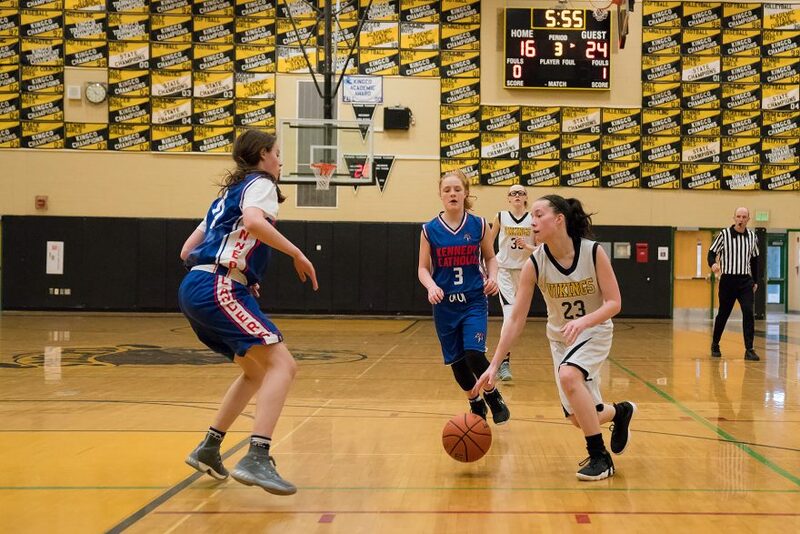 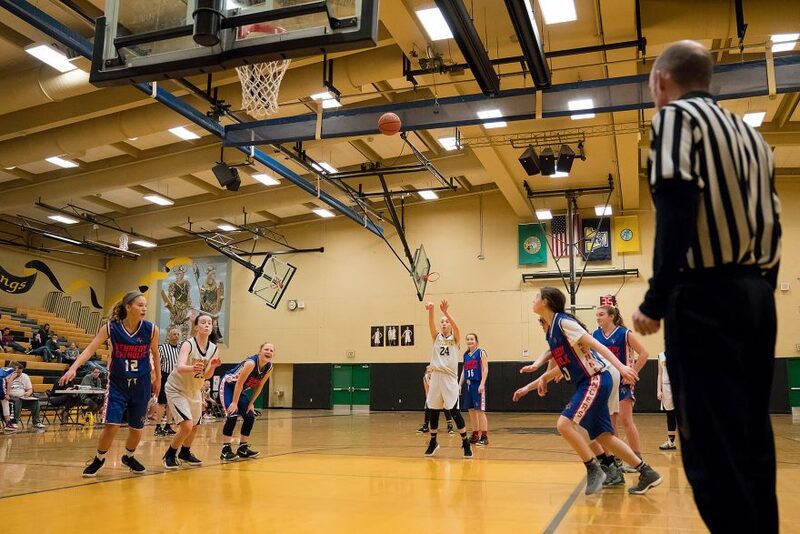 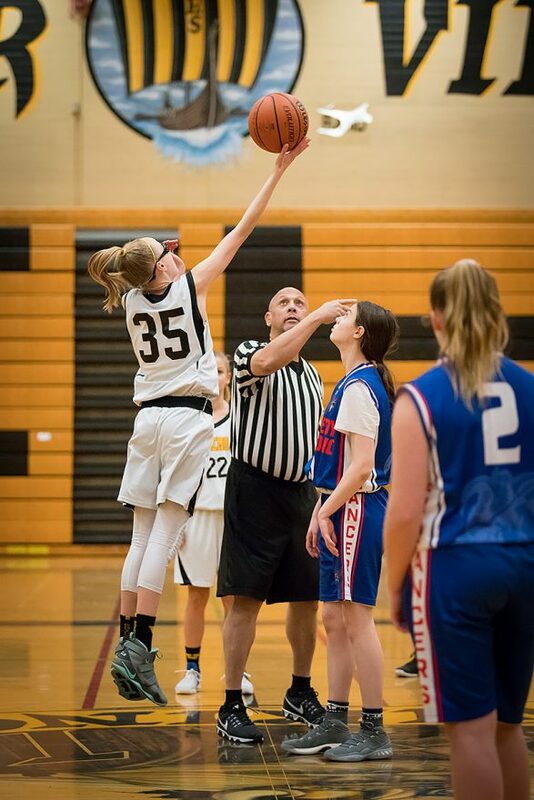 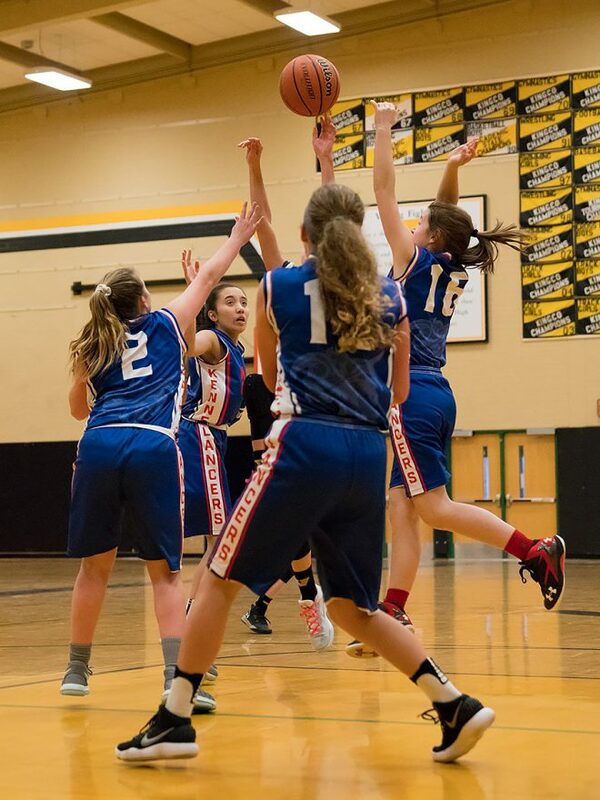 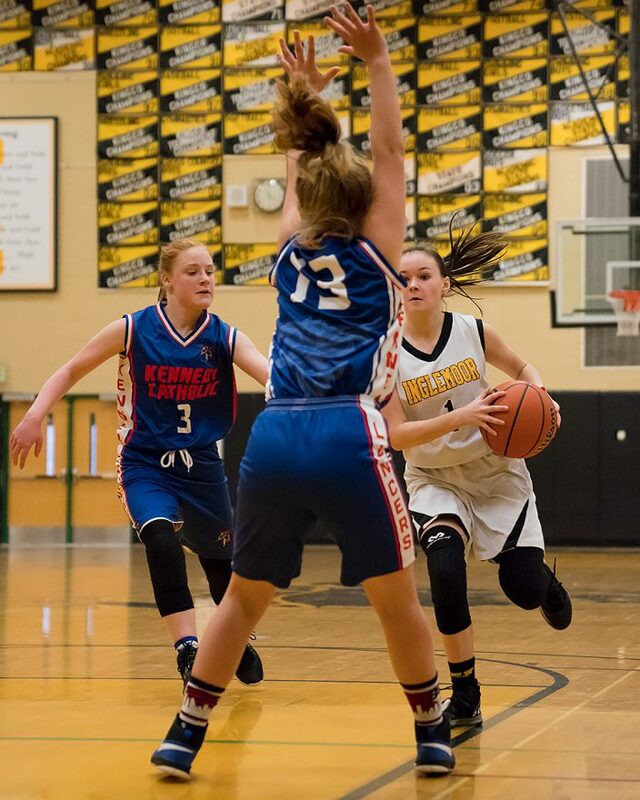 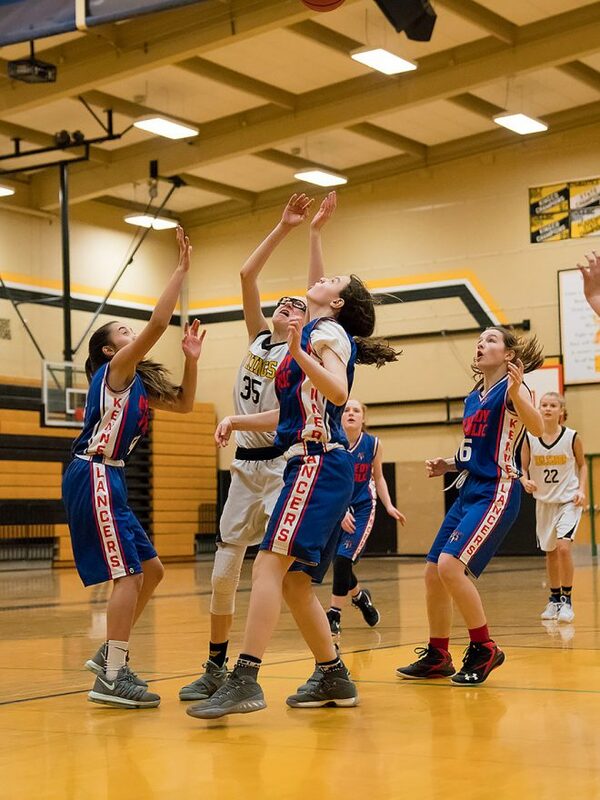 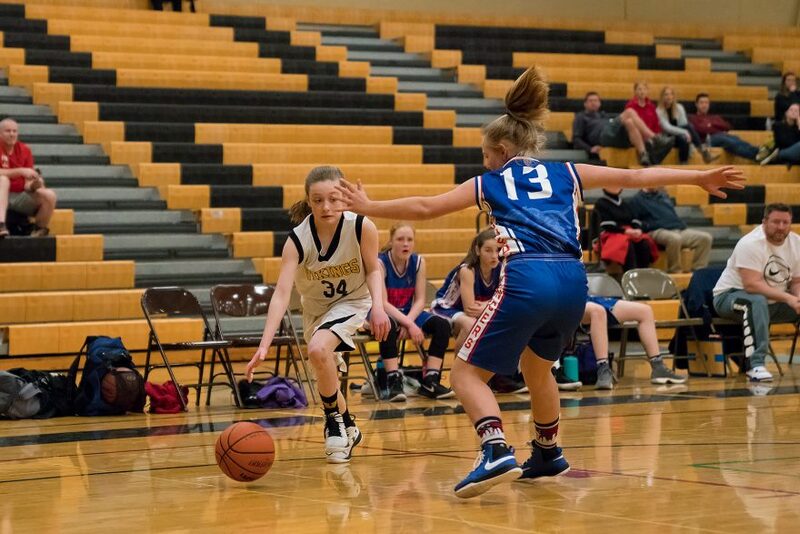 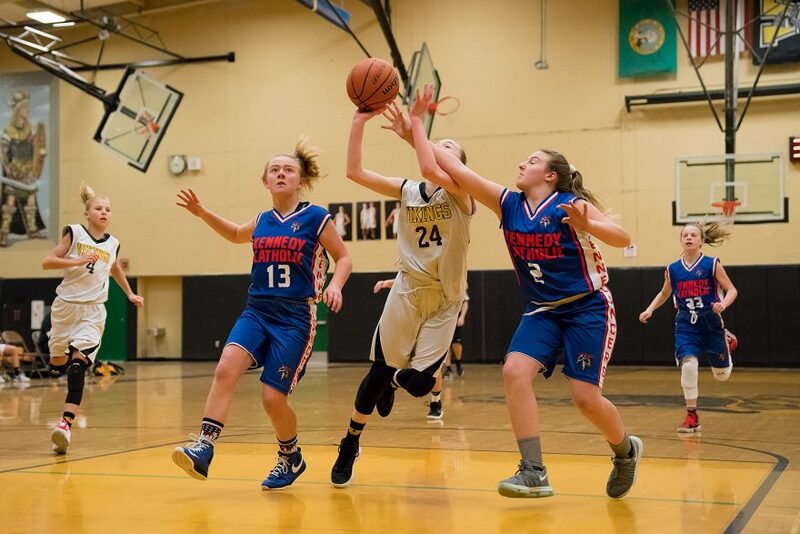 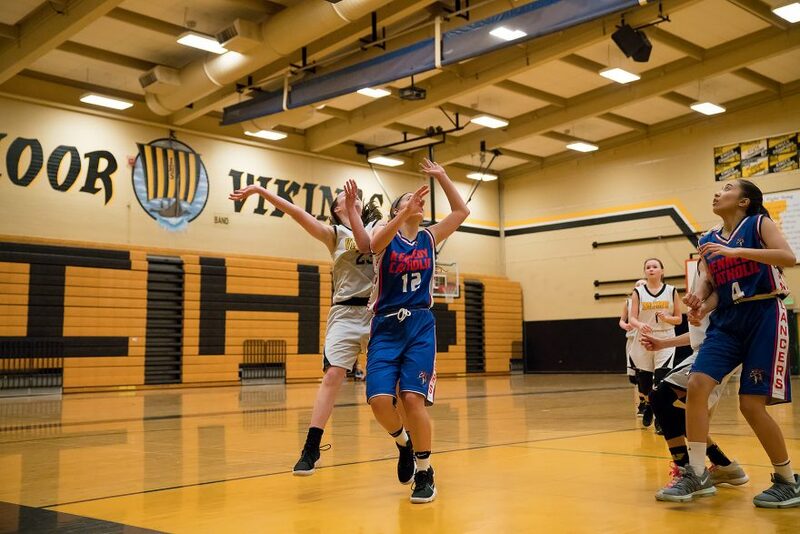 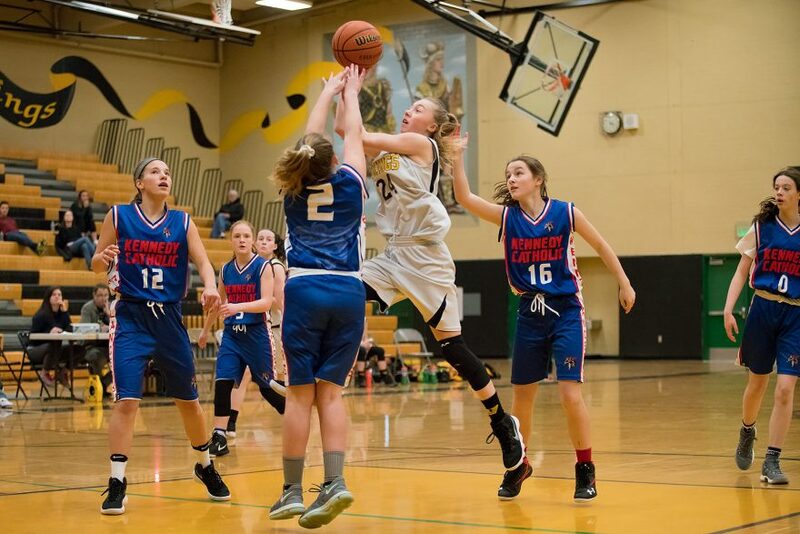 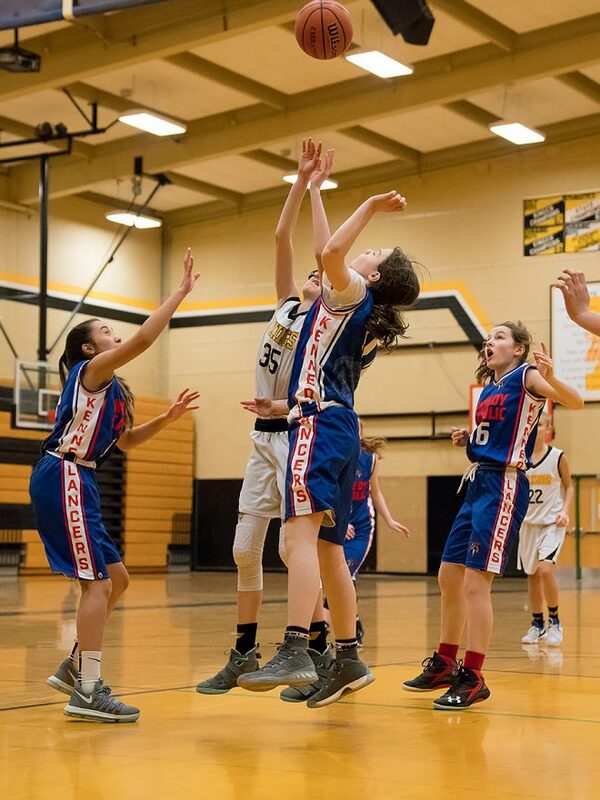 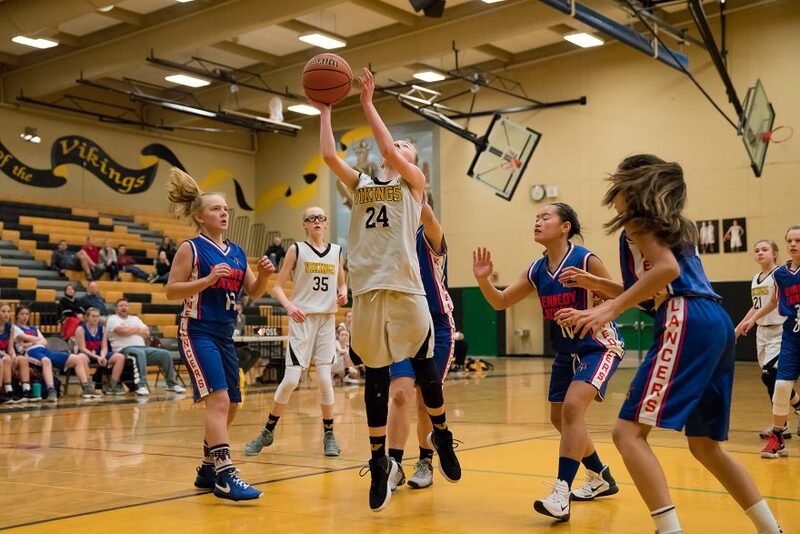 On Sunday afternoon, in their third game of the weekend, the Vikings faced the Lancers of Kennedy Catholic at Inglemoor High School. 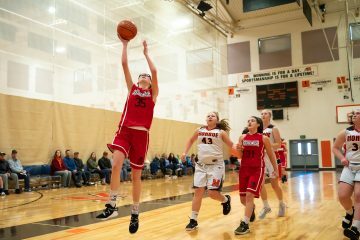 Despite an uncontested tip-off, the Lancers quickly jumped out to a 6-0 lead after just a minute and a half of play, hitting three from the paint and relying heavily on muscle on defense. 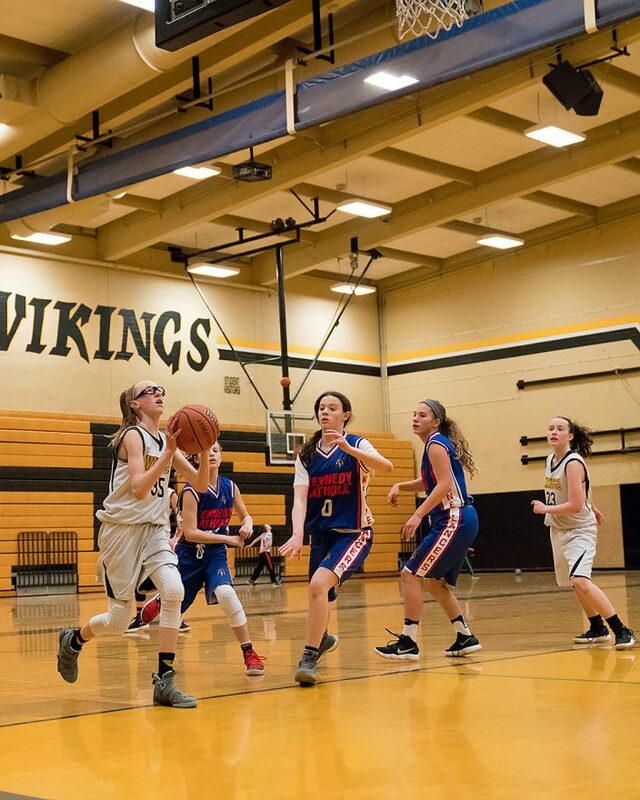 After some adjustments, though, the Vikings closed the gap to a single point (6-5) with about two minutes left in the quarter. 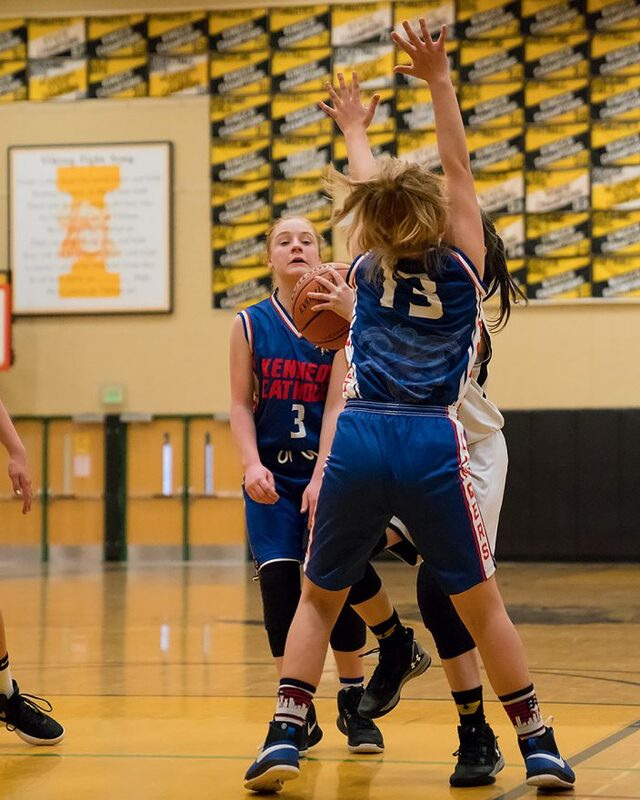 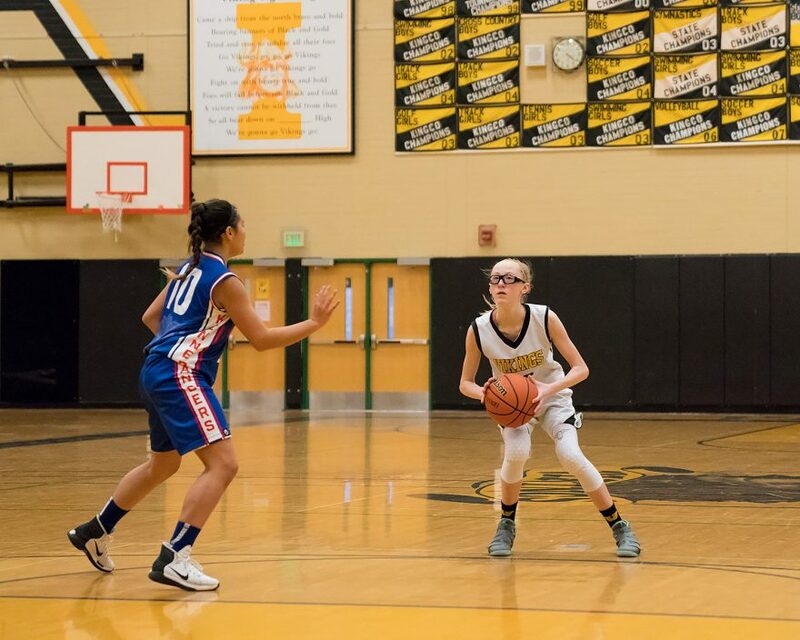 But the Kennedy Girls were not through, and in the remaining two minutes of the quarter, they put nine more on the board, closing the quarter ahead by 10 (15-5). 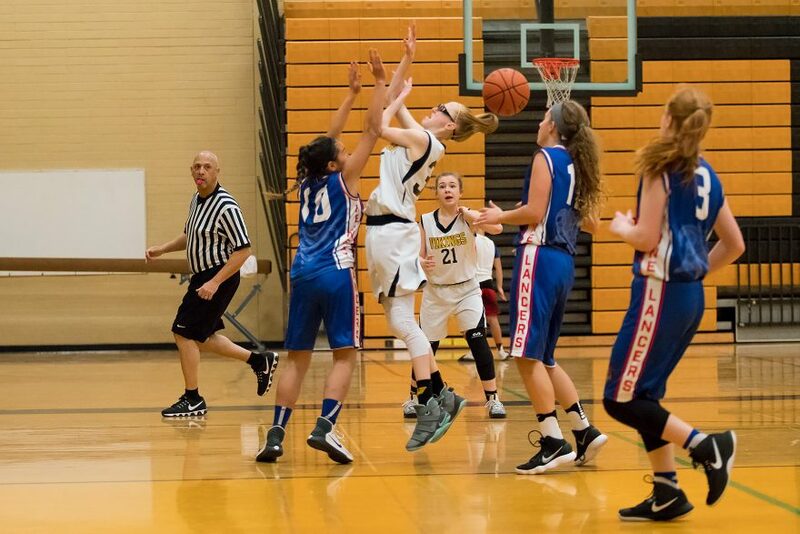 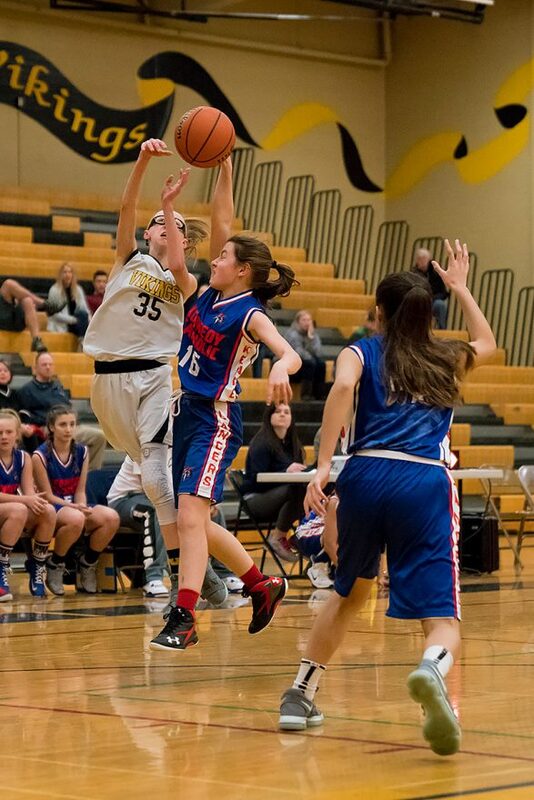 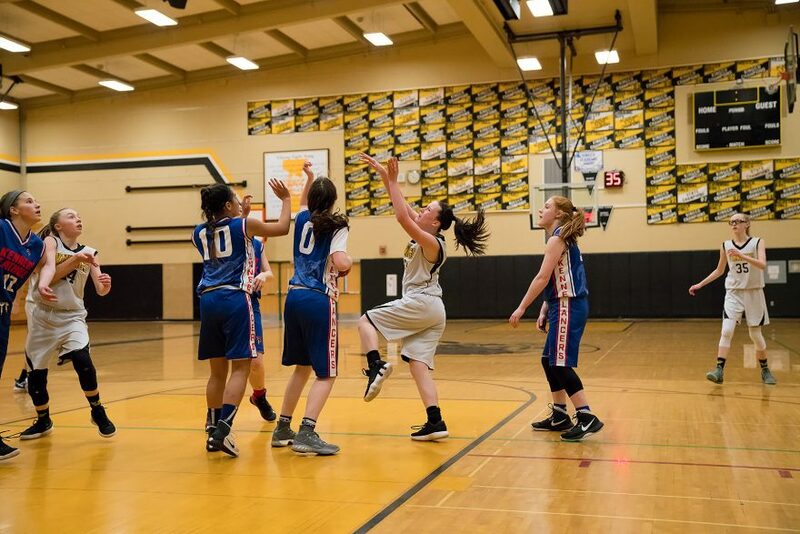 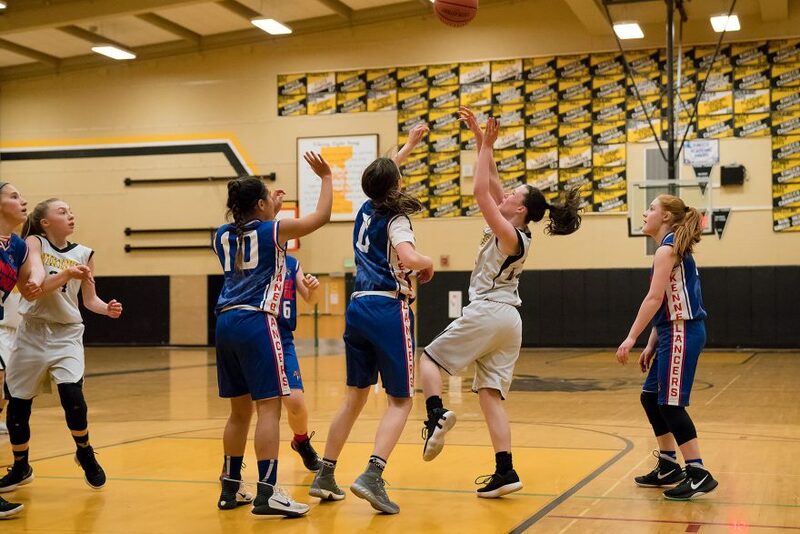 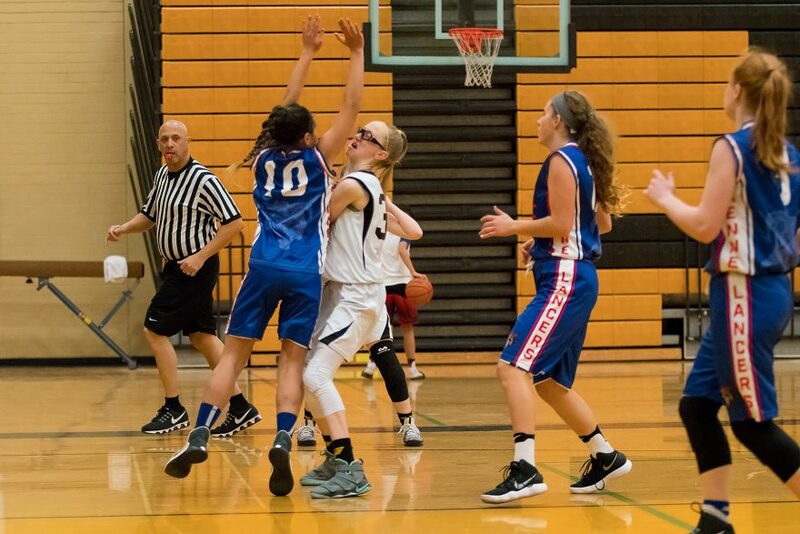 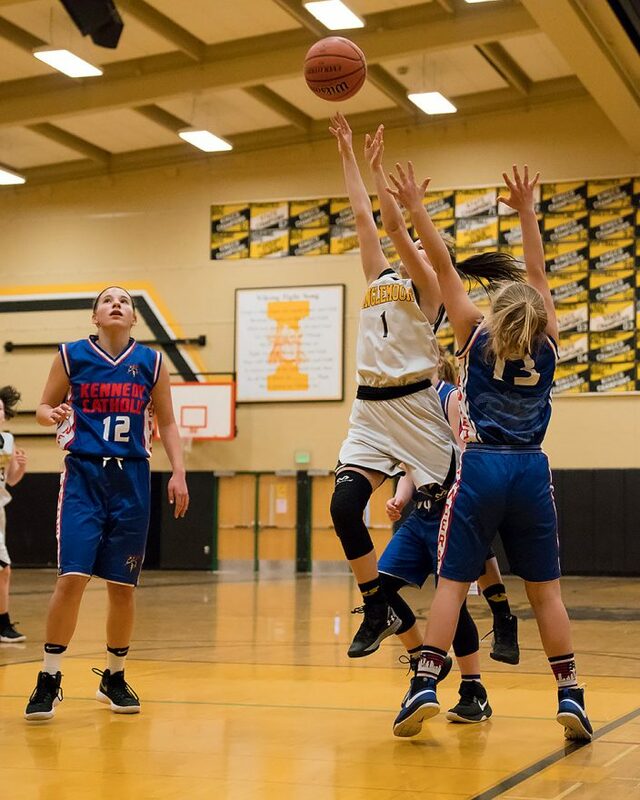 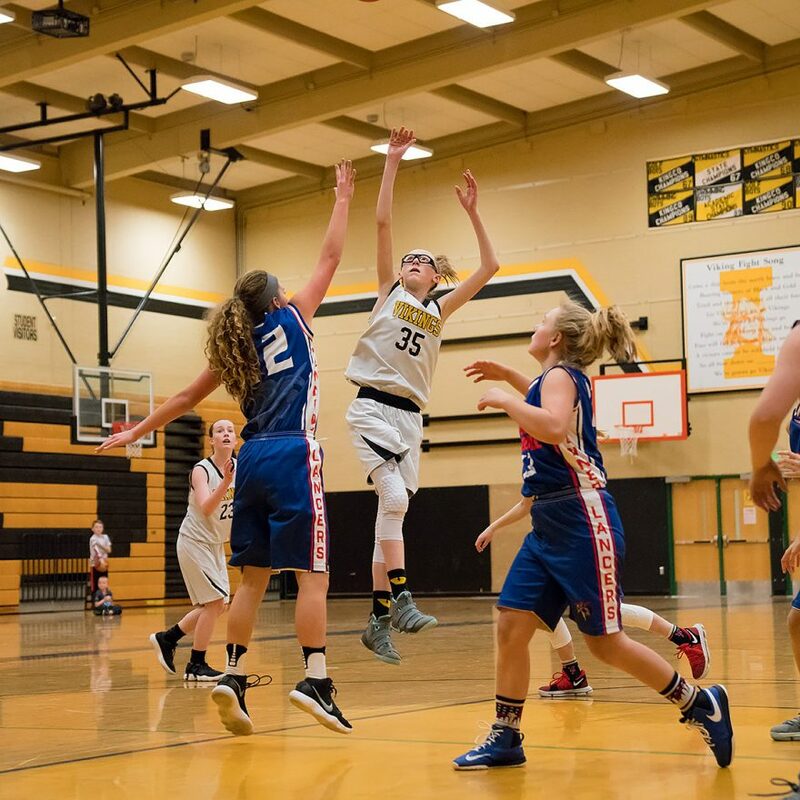 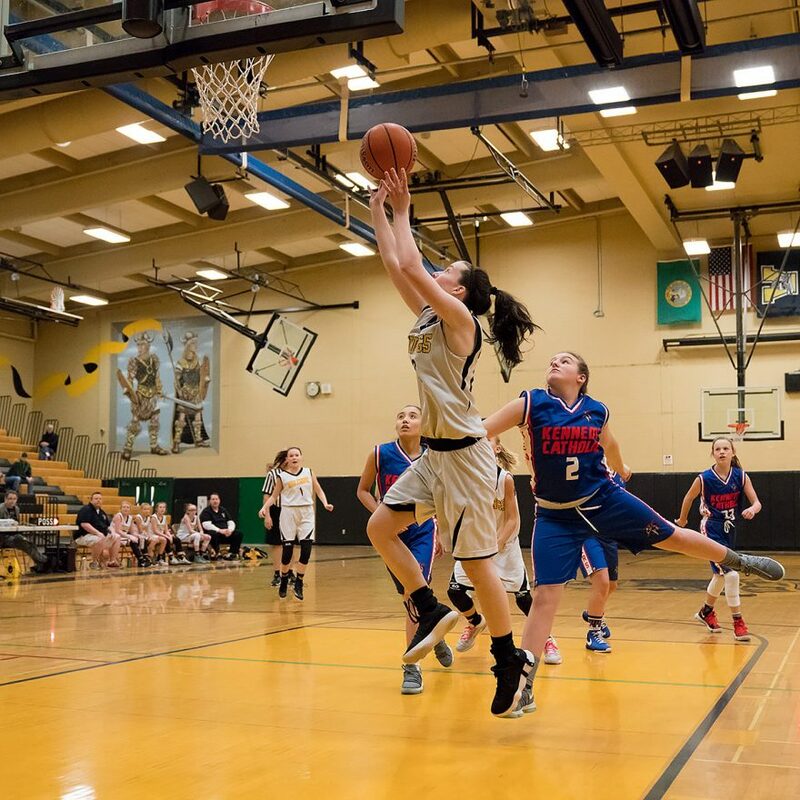 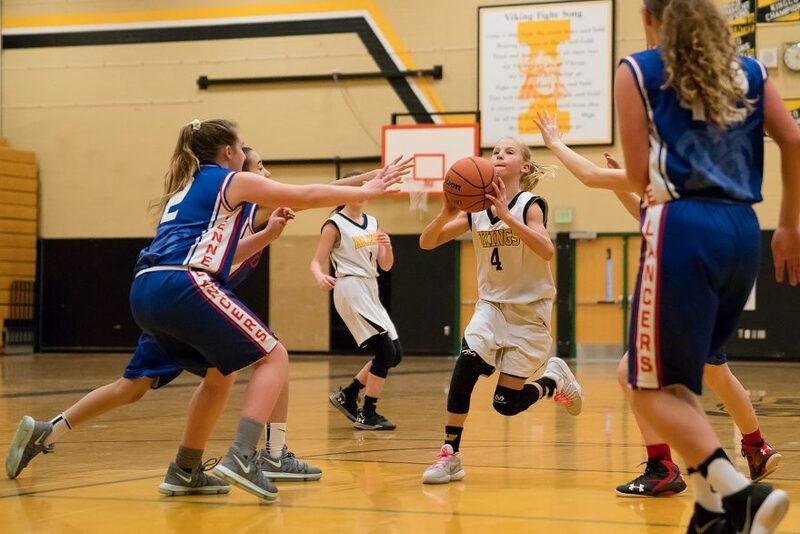 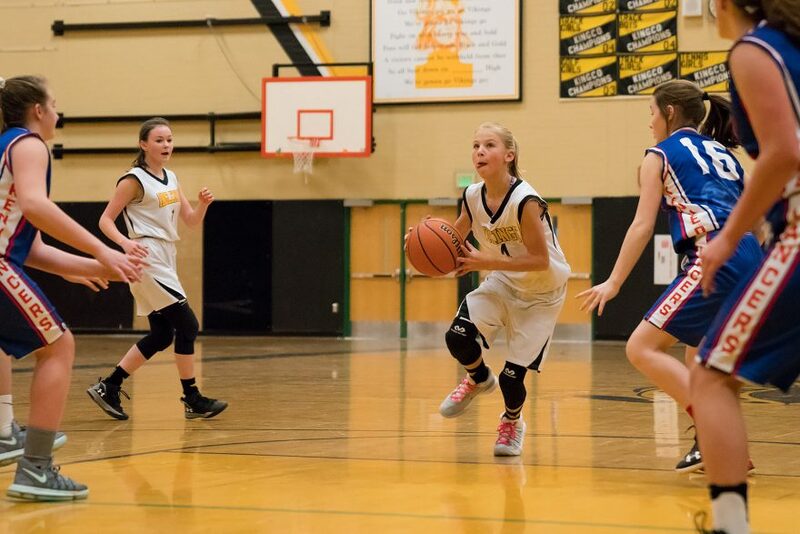 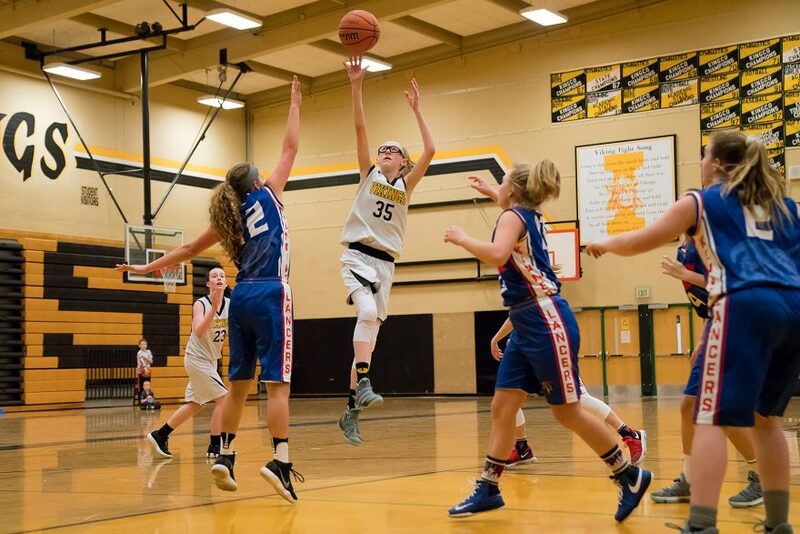 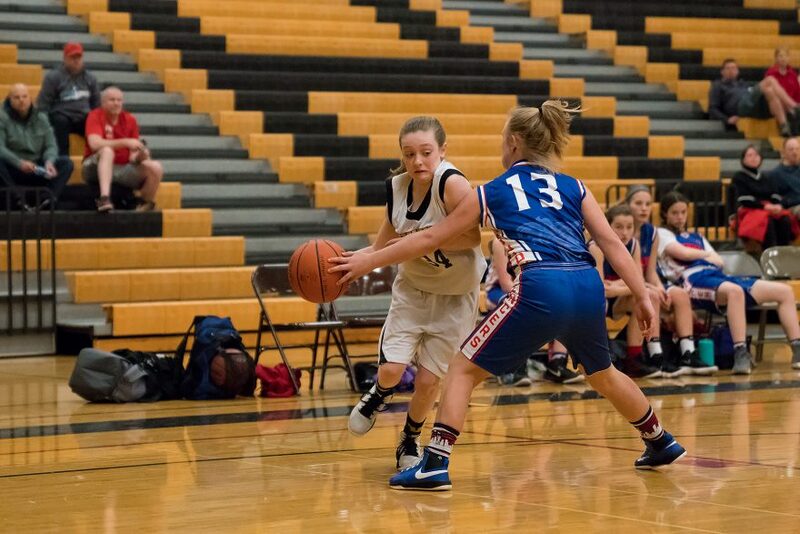 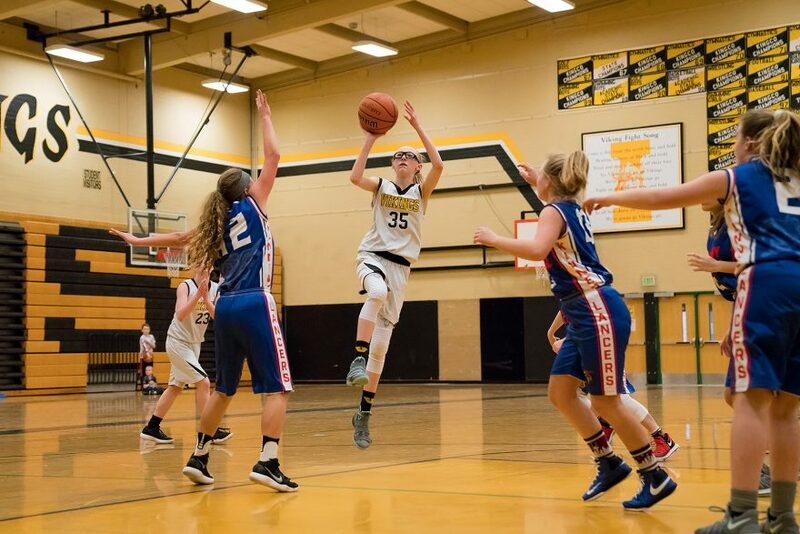 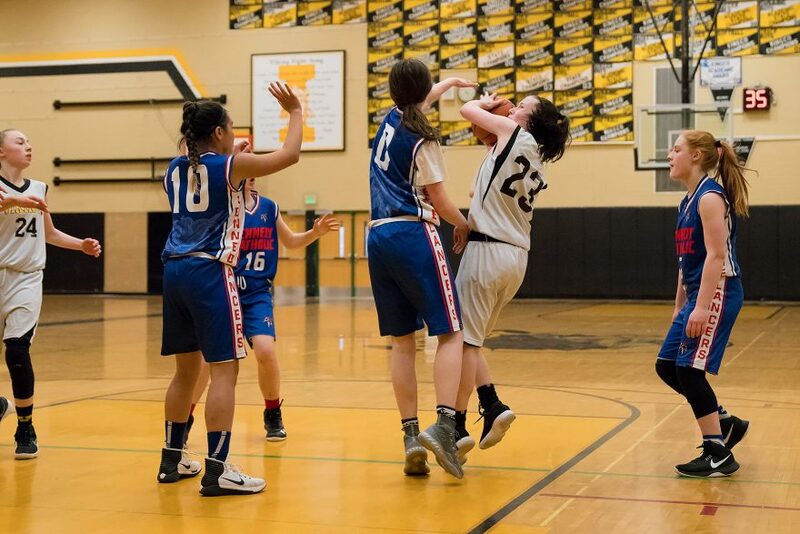 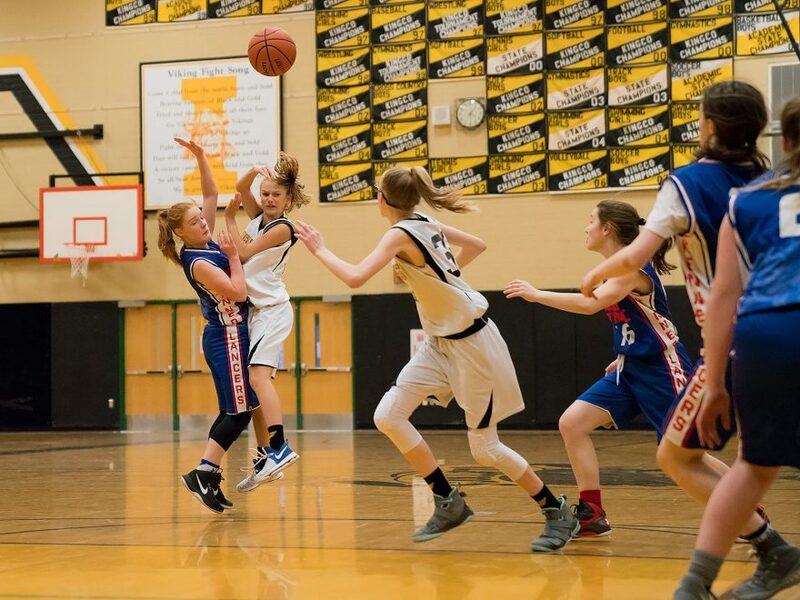 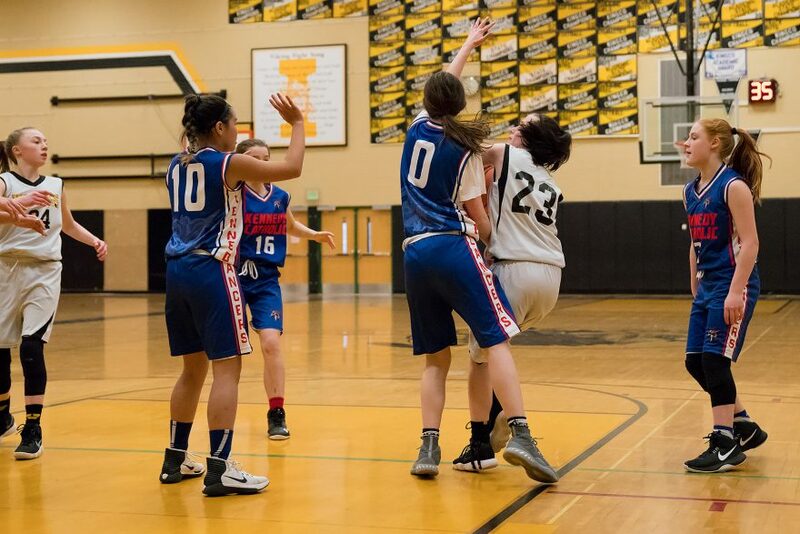 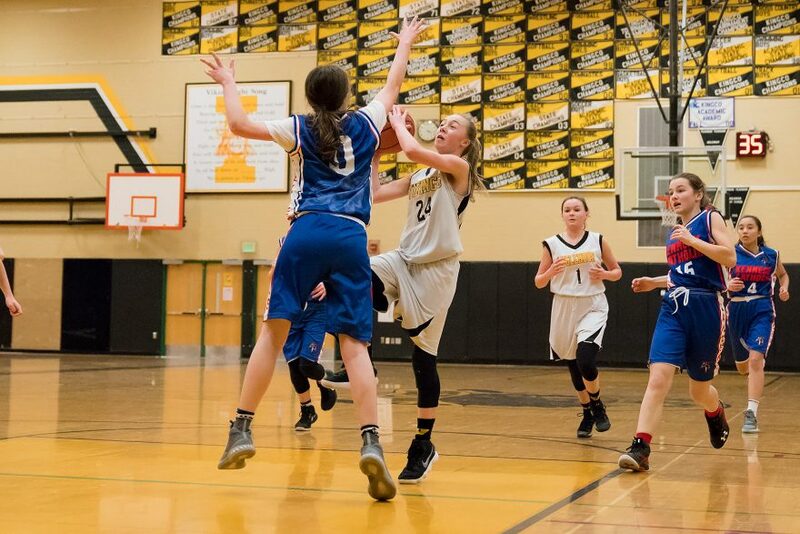 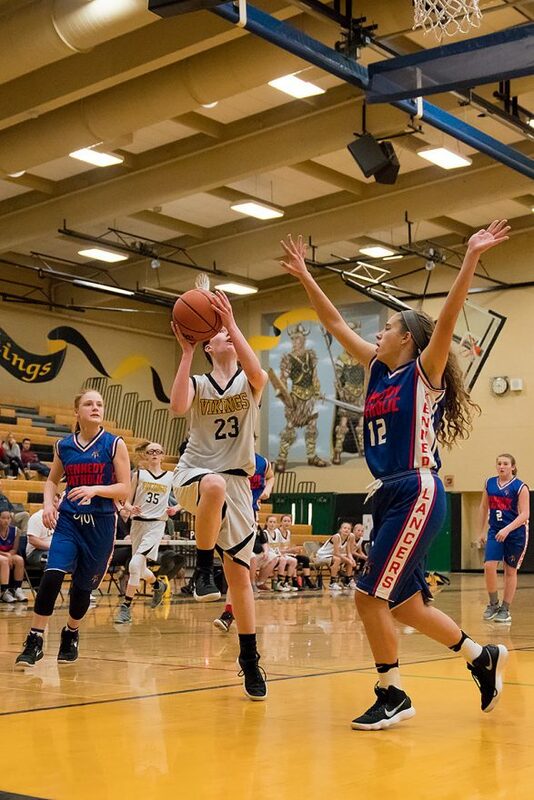 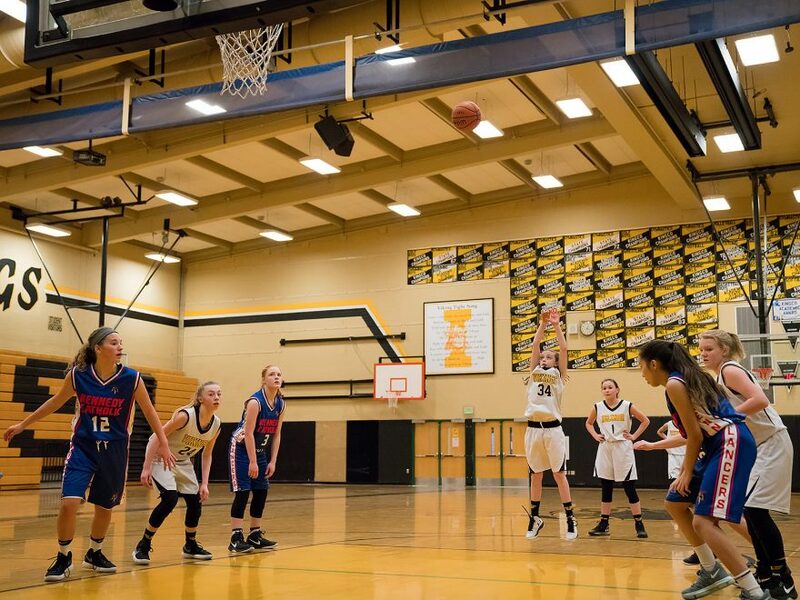 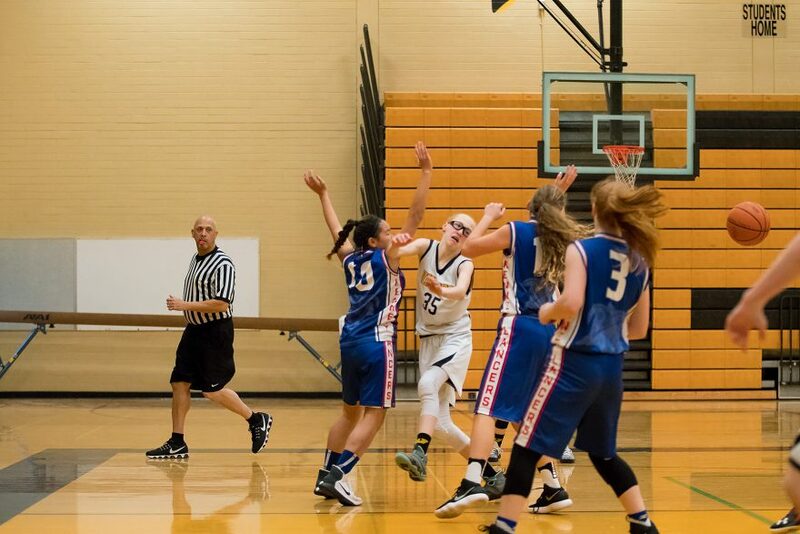 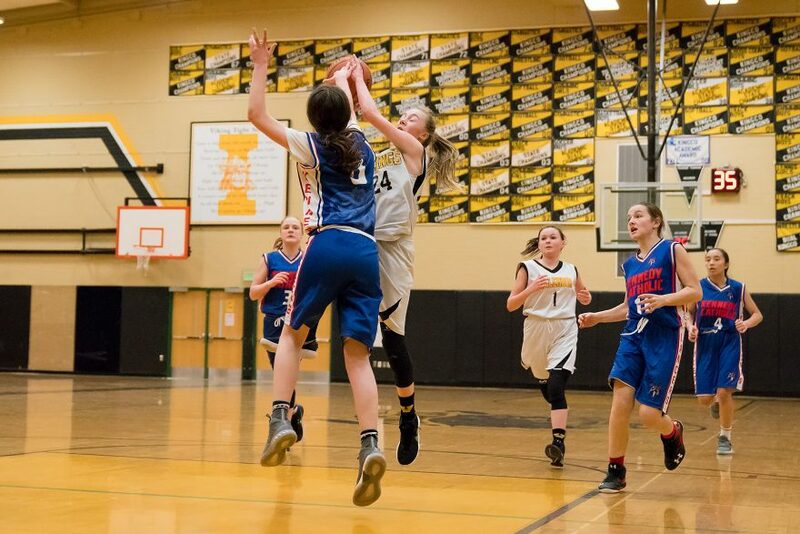 It wasn’t until two minutes into the second quarter that Inglemoor found the net again. 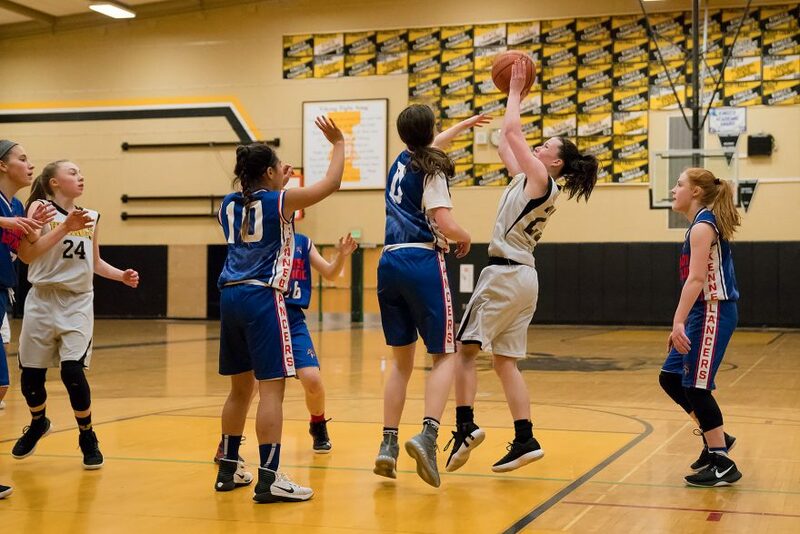 They followed up with another two points halfway through the quarter, but were still behind 18-9. 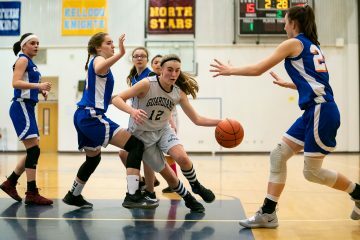 At halftime, the Lancers had held onto the bulk of their lead, with a score of 20-13. 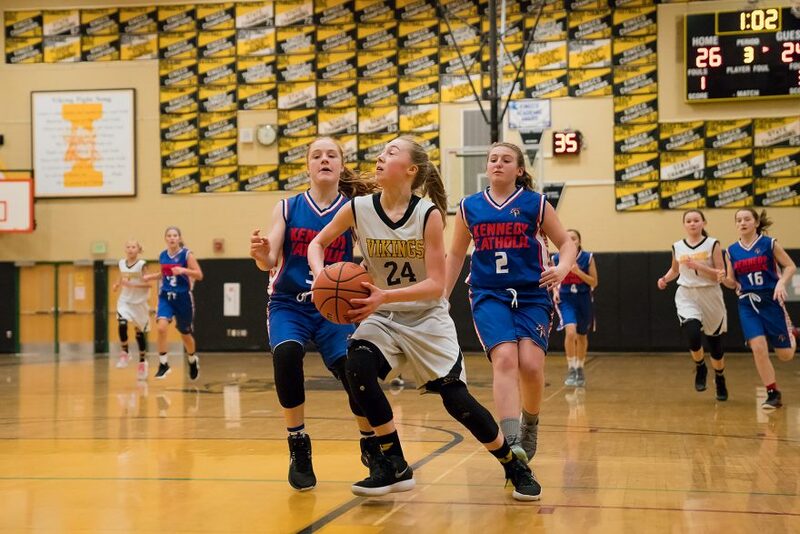 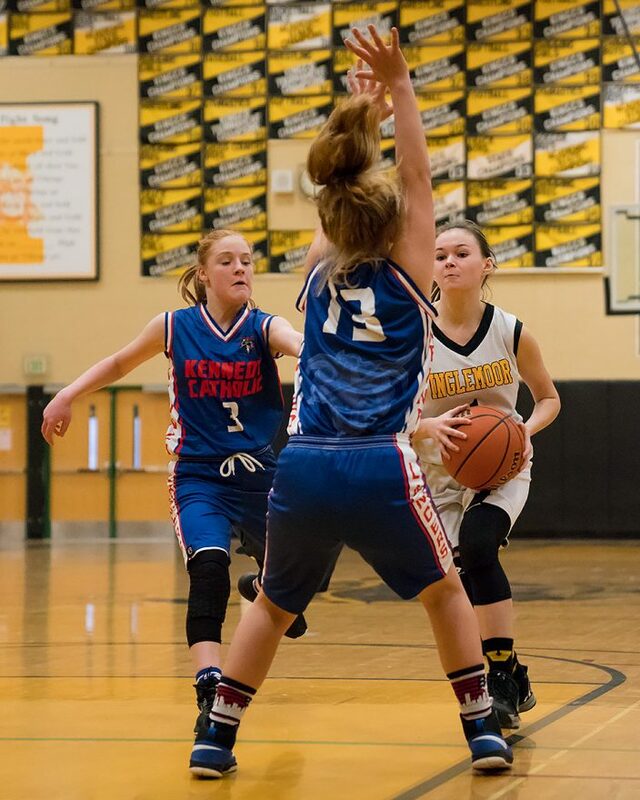 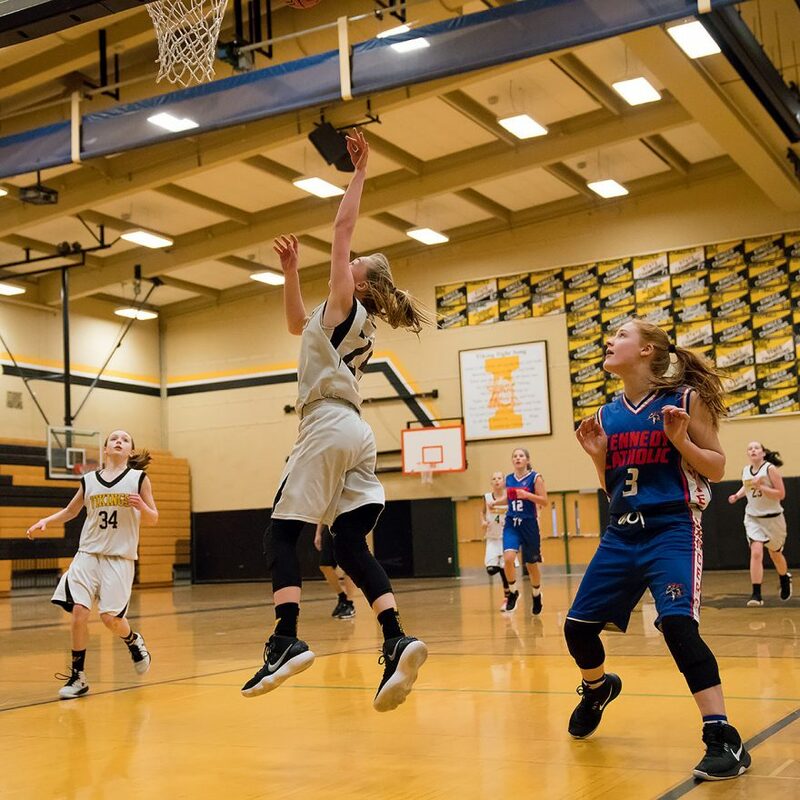 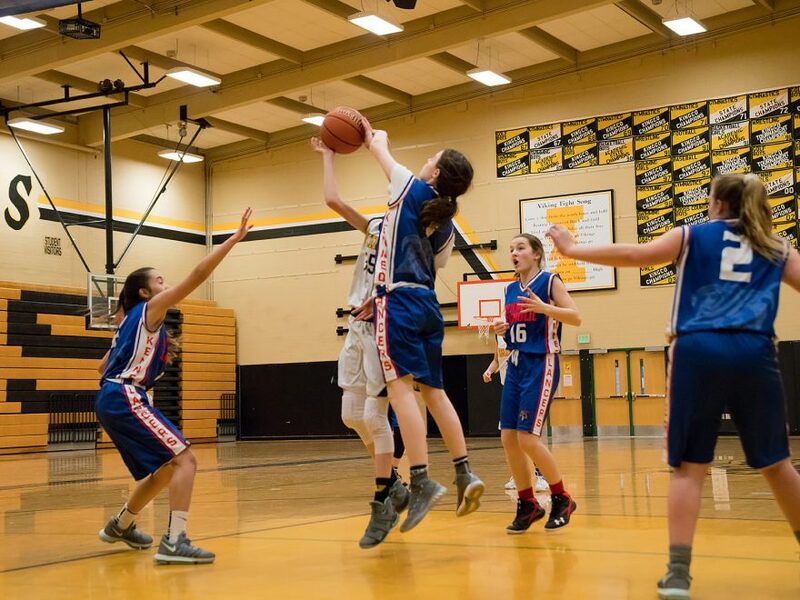 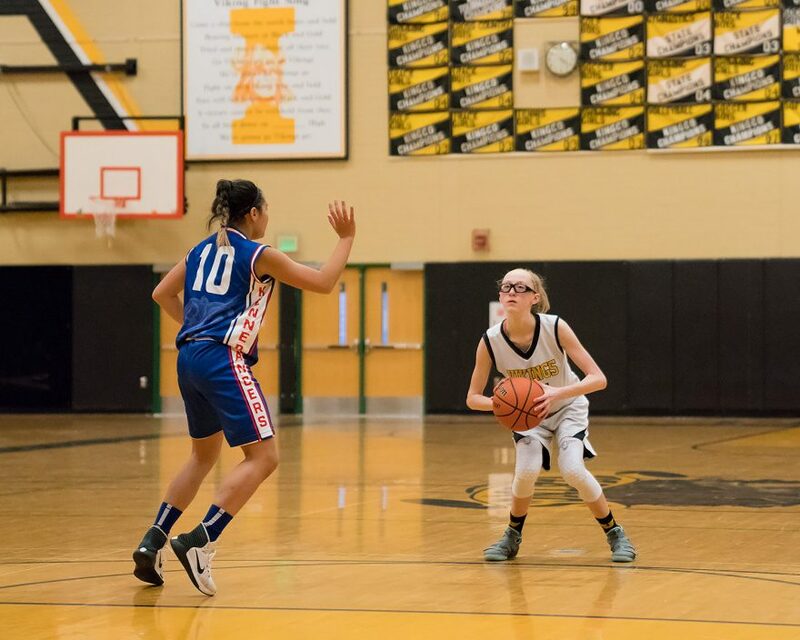 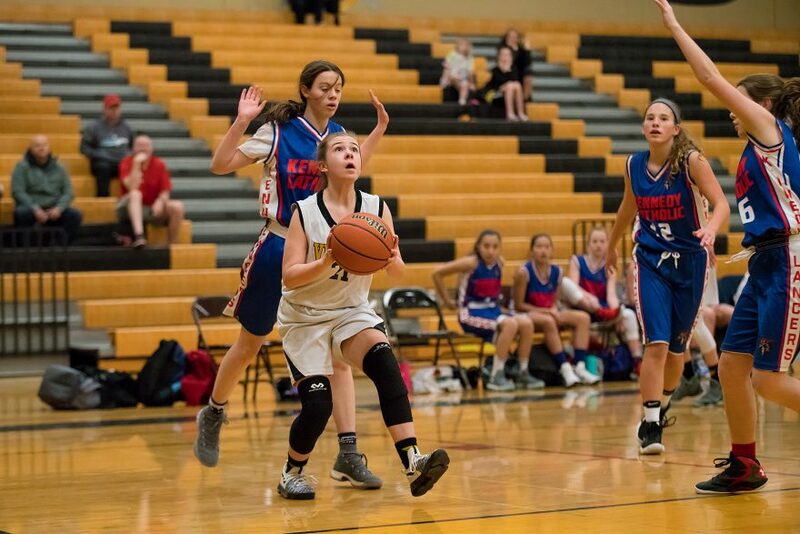 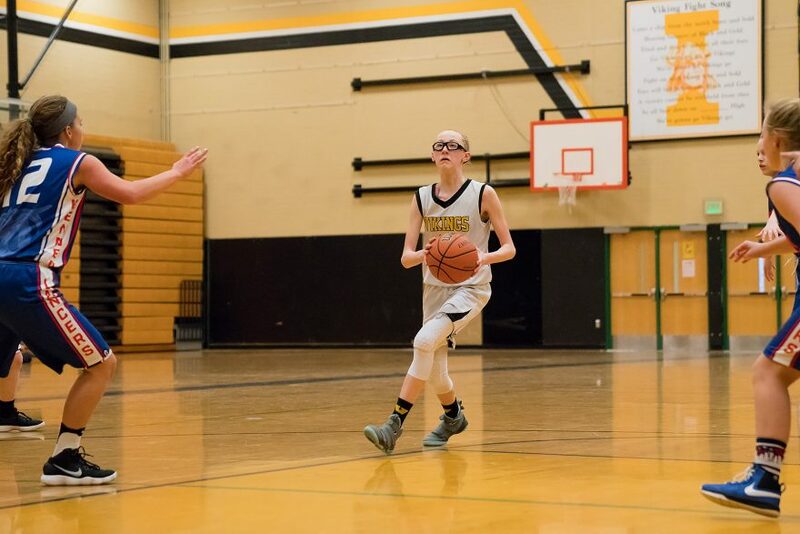 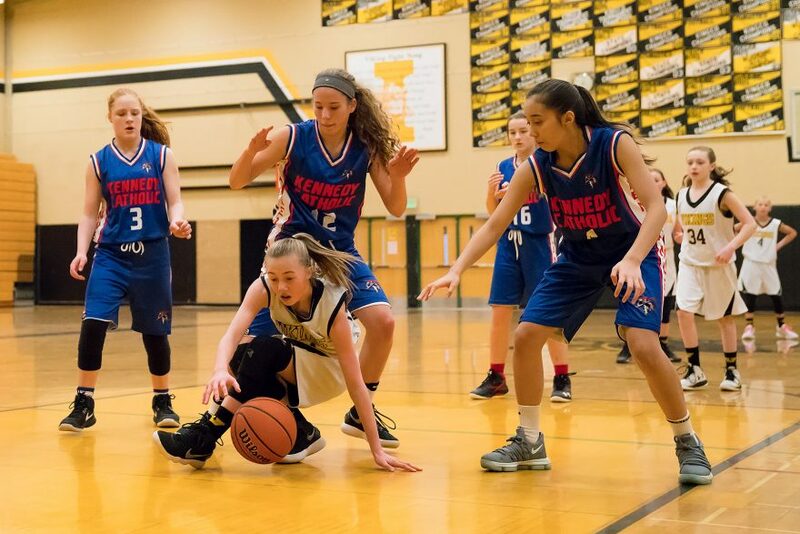 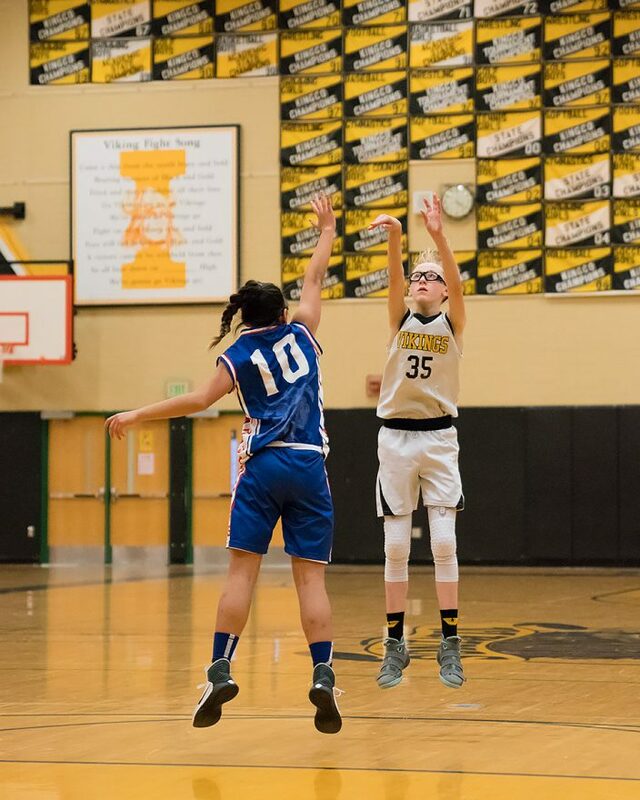 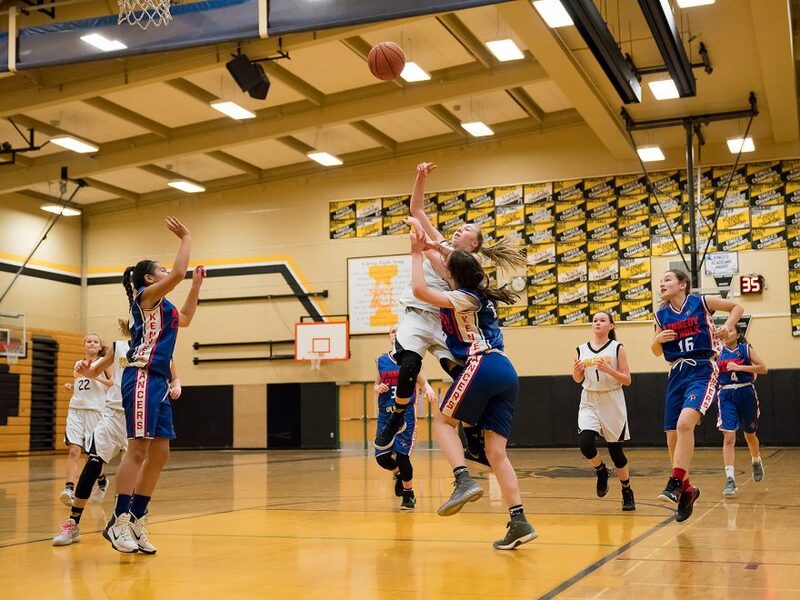 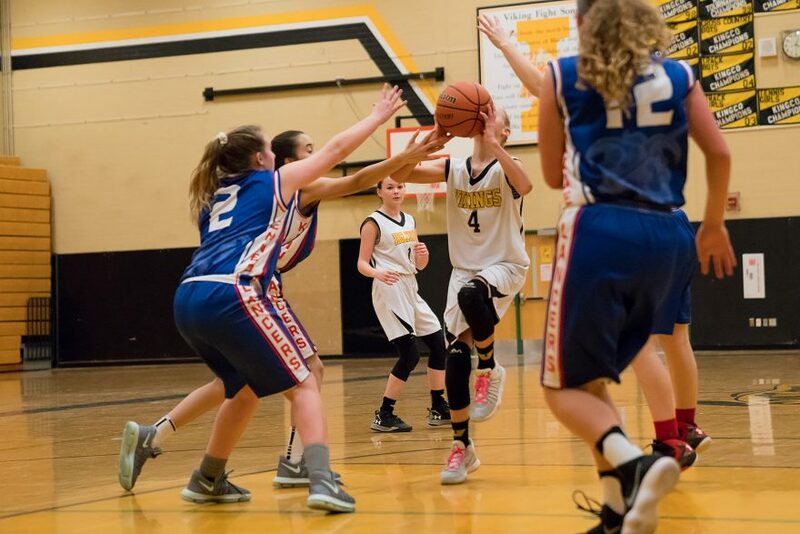 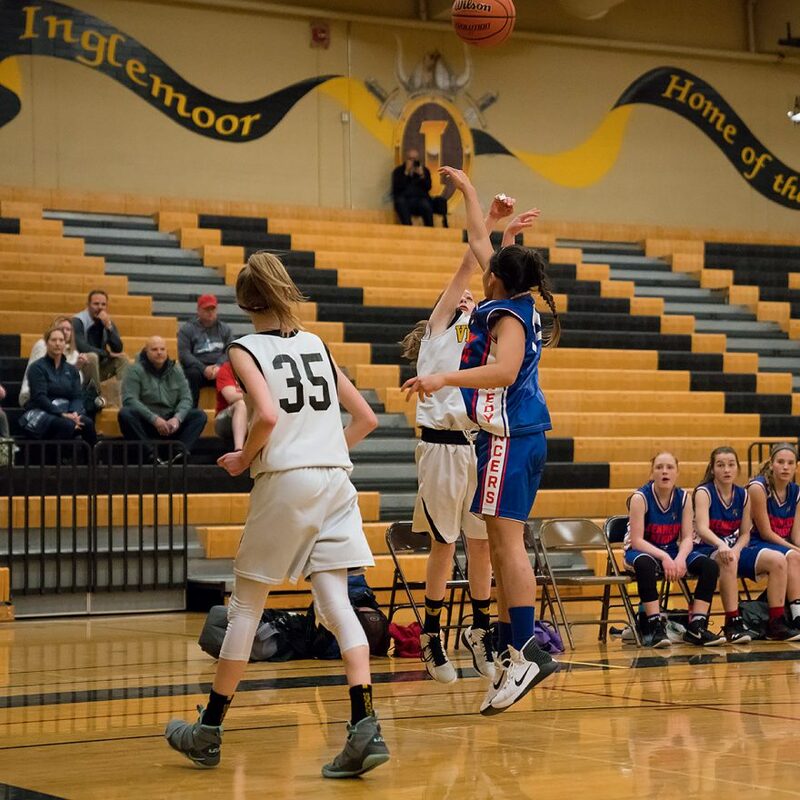 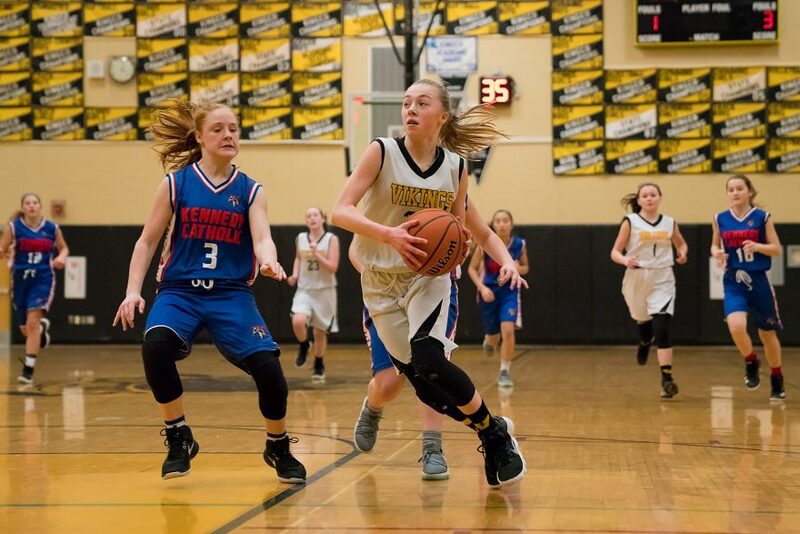 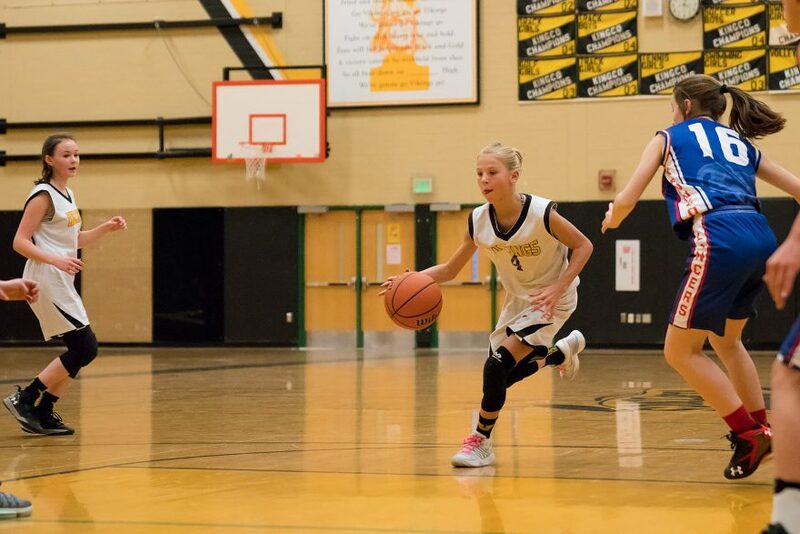 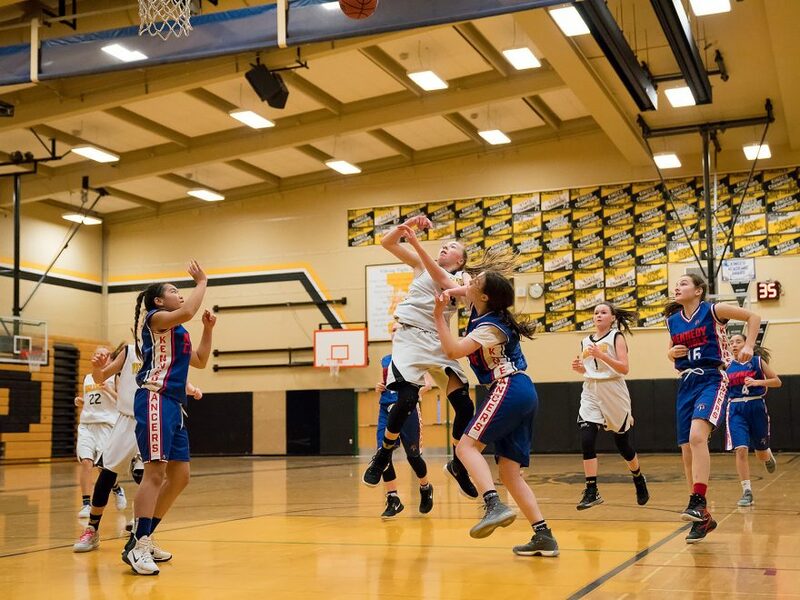 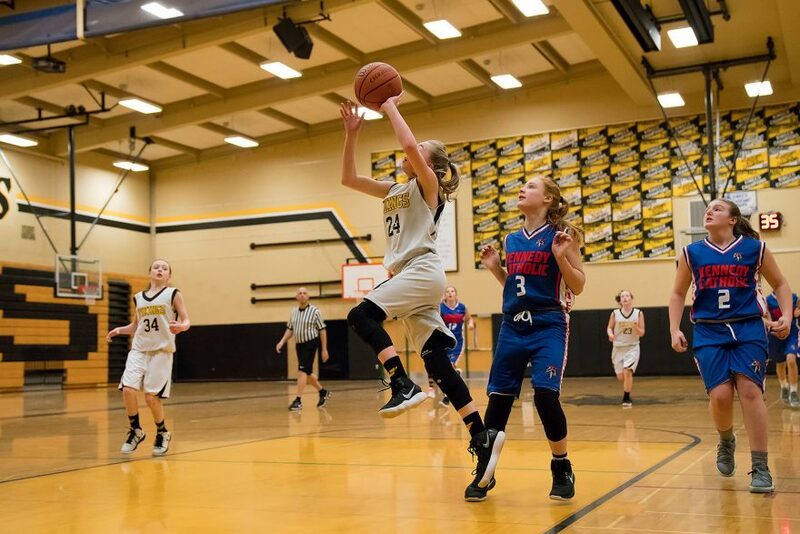 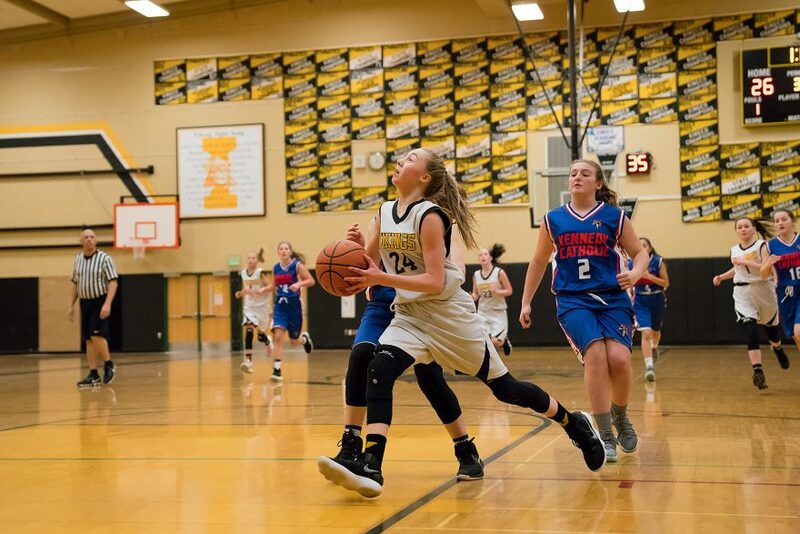 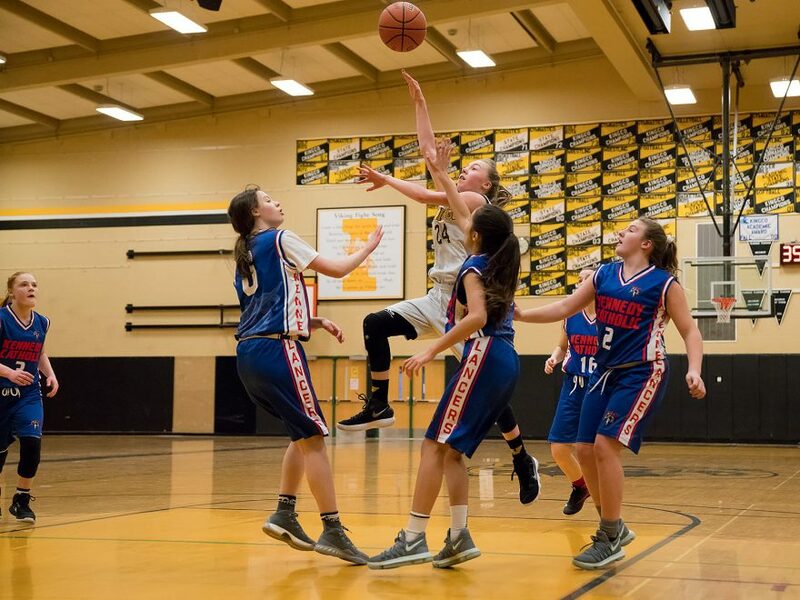 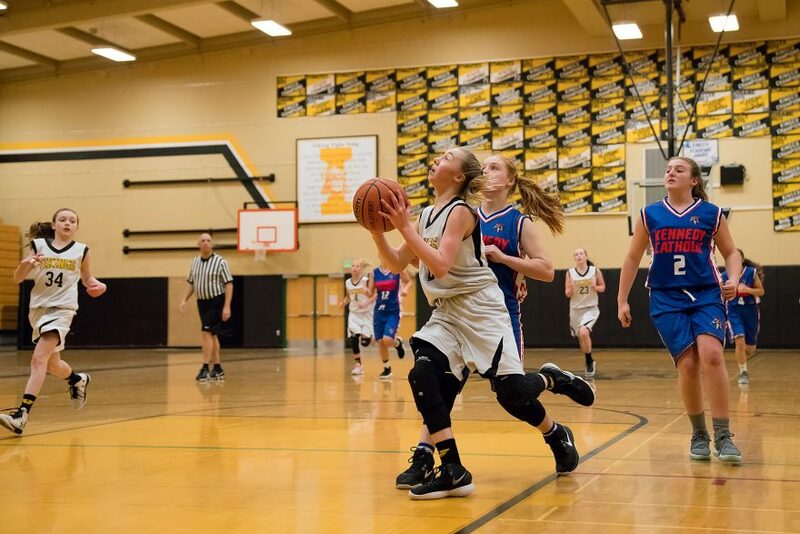 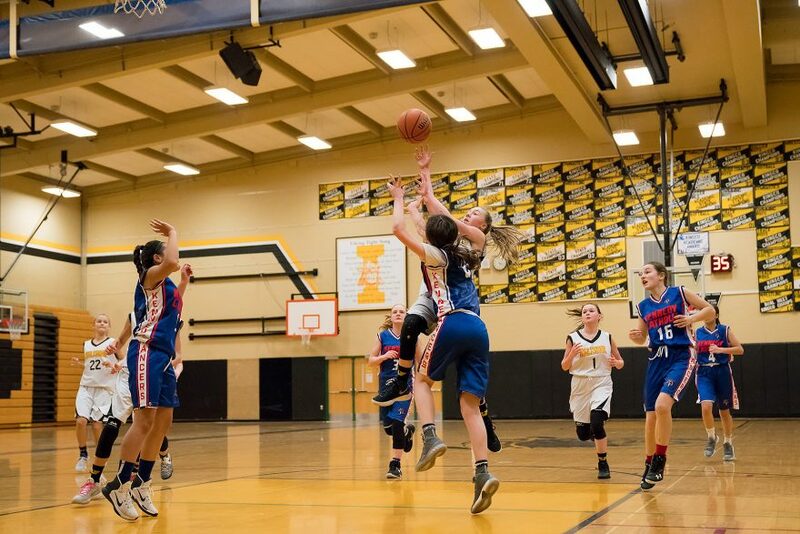 Looking at the scoreboard and the obstreperous, physical play that they faced, it might have been easy for Inglemoor to get discouraged during the break. 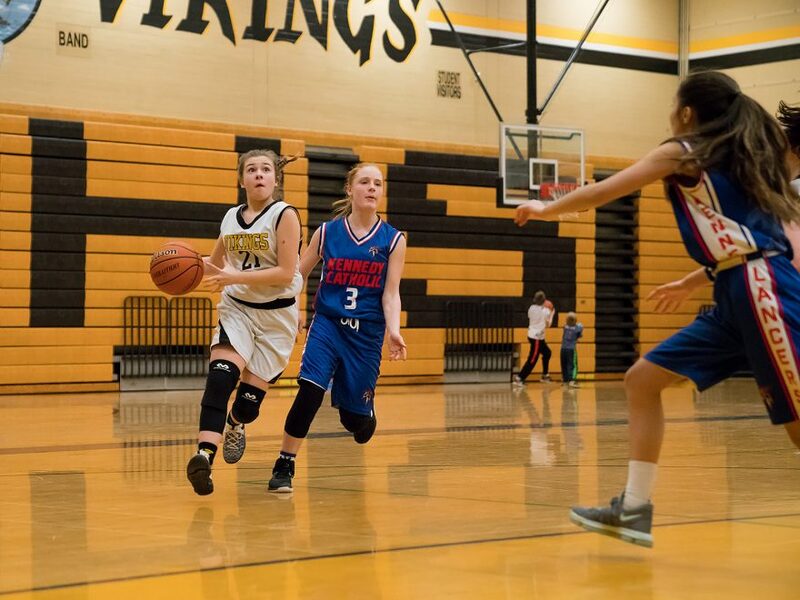 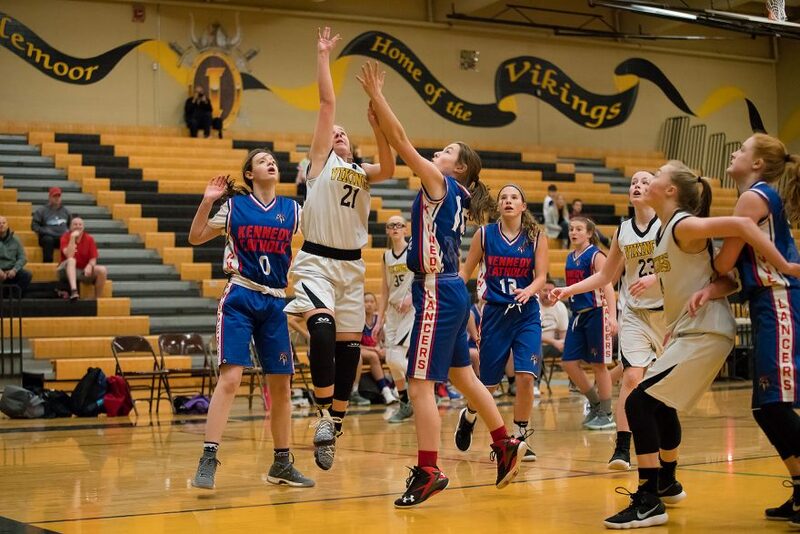 Instead, the Vikings came out from halftime fired-up and played excellent defense, holding Kennedy to only four points in the first seven minutes of the quarter. 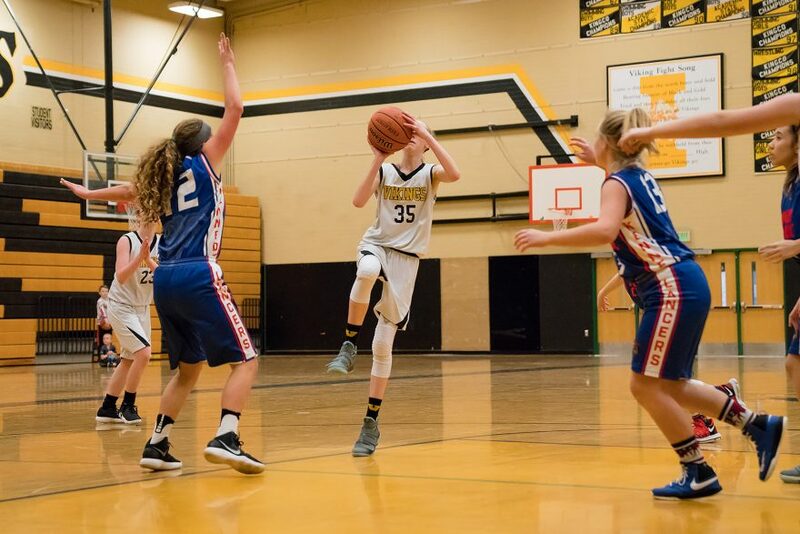 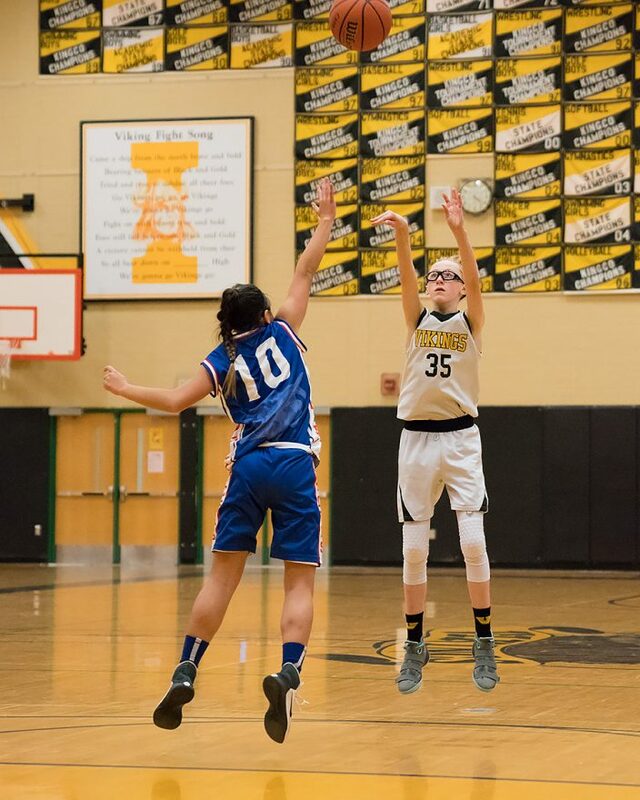 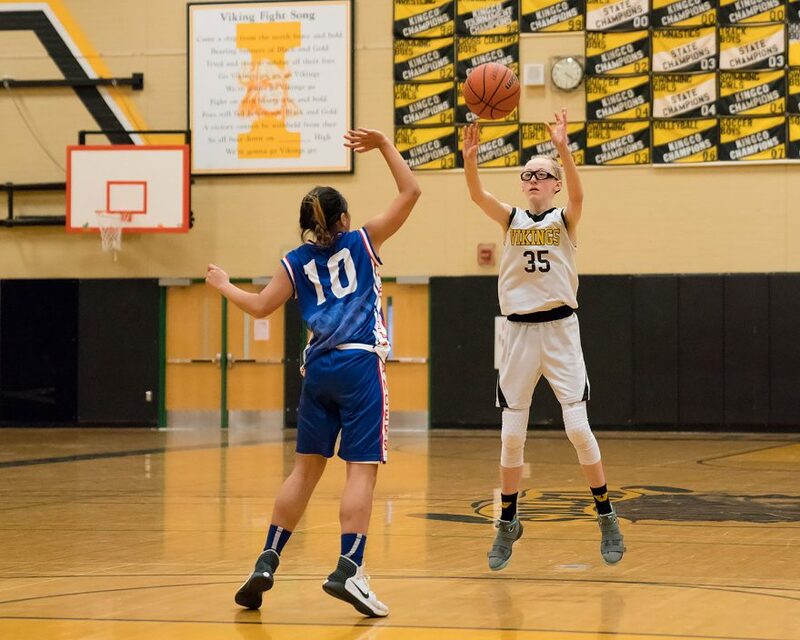 Meanwhile, after an early shot from the floor and a free-throw by #24 (24-16), #1 sunk a layup through traffic (24-18), #35 dropped in a strong-side layup (24-20), #4 plowed down the lane and found the net, and #35 hit another from the paint to tie the game. 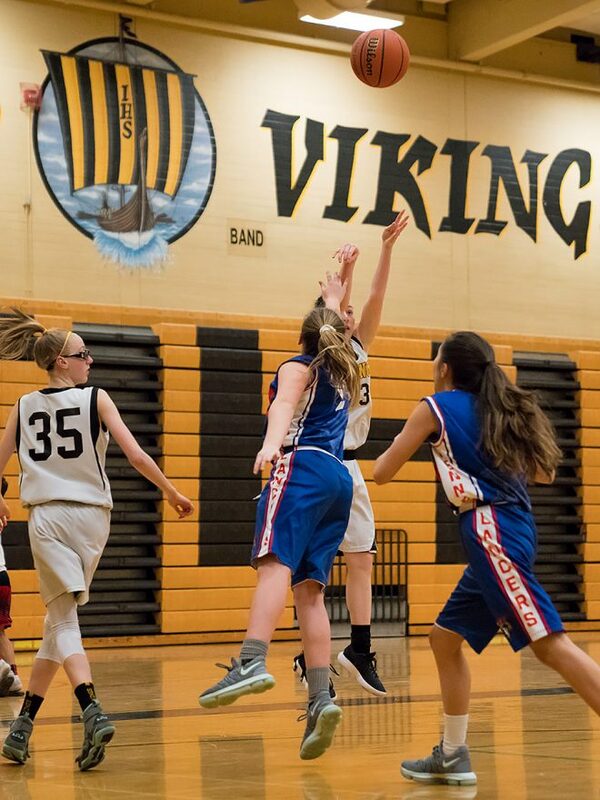 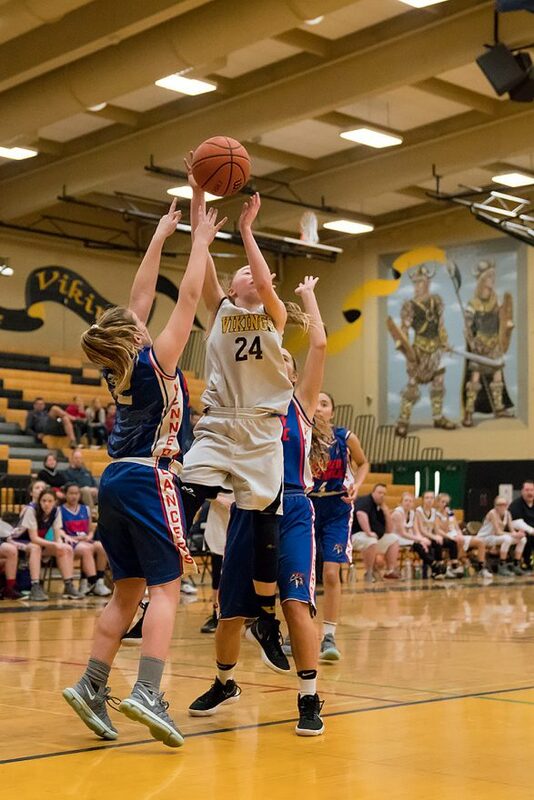 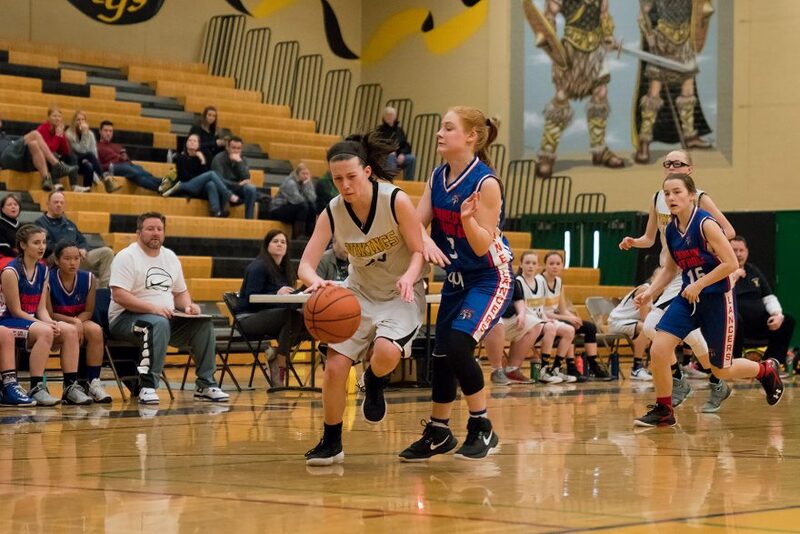 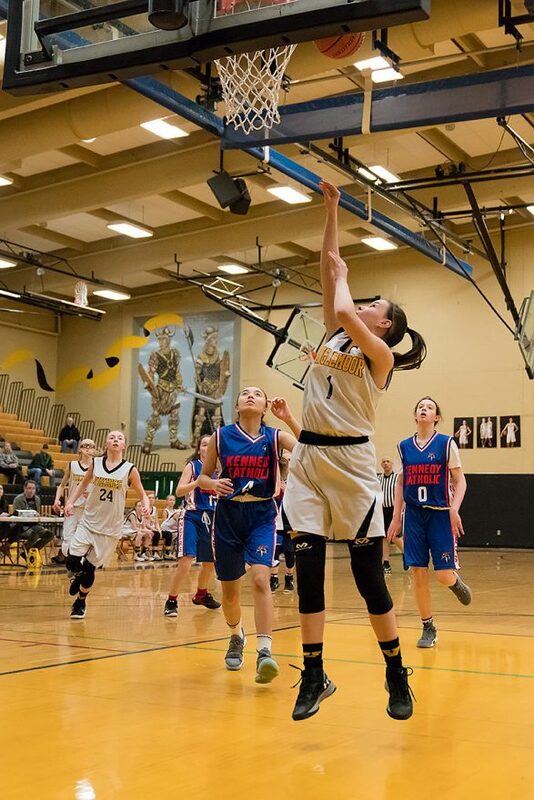 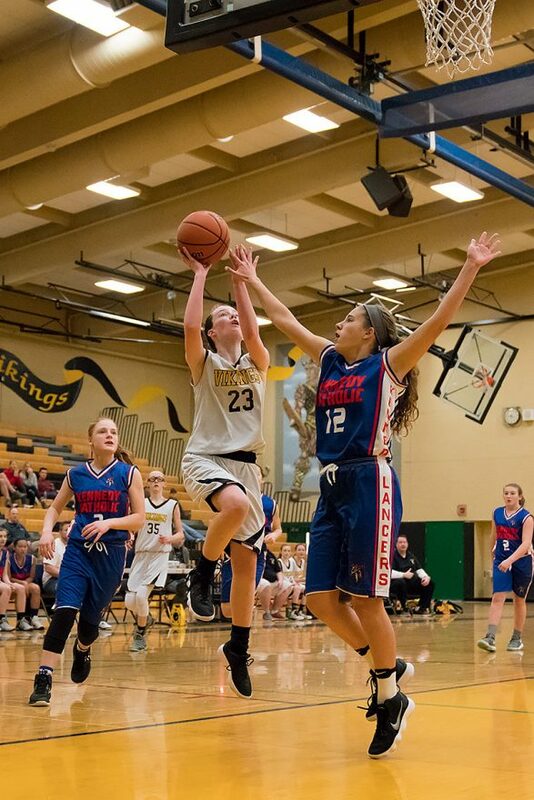 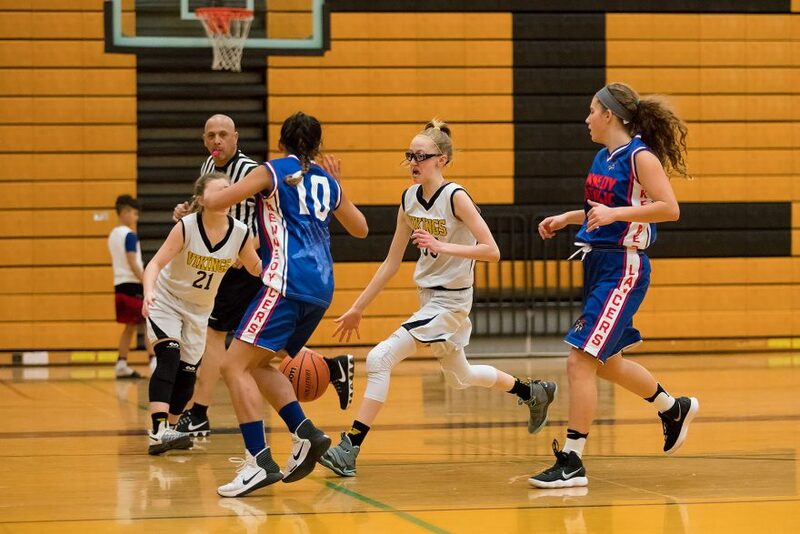 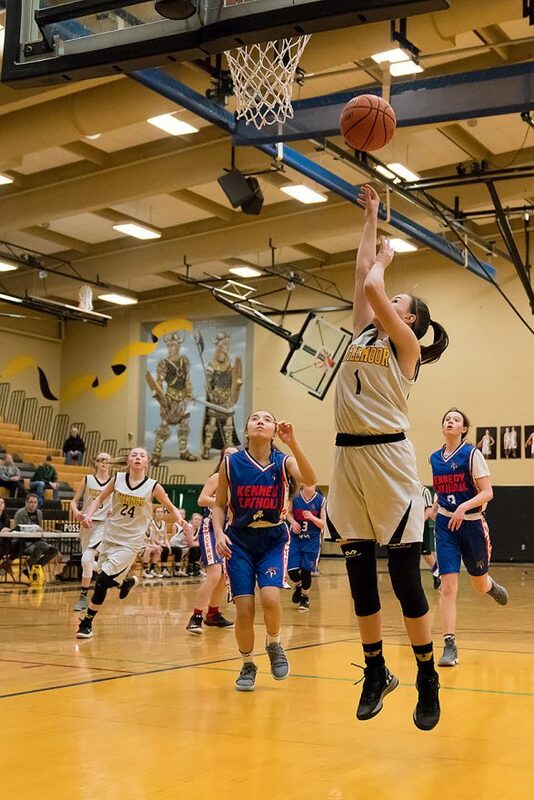 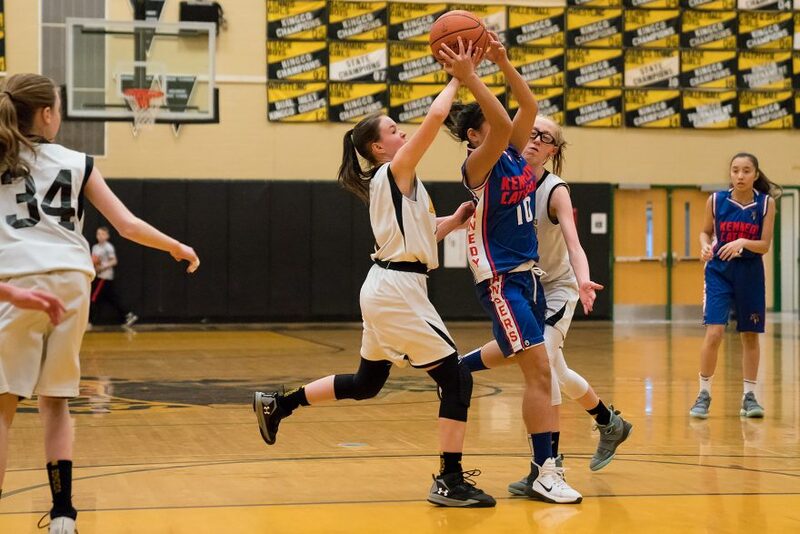 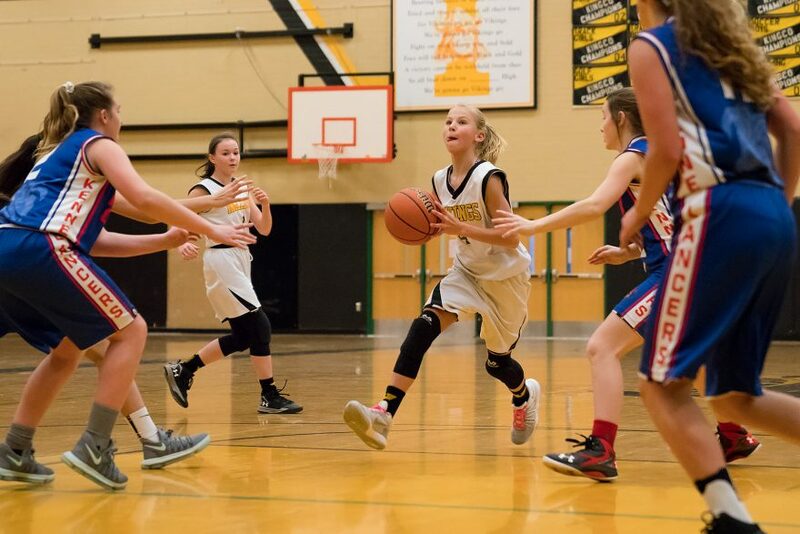 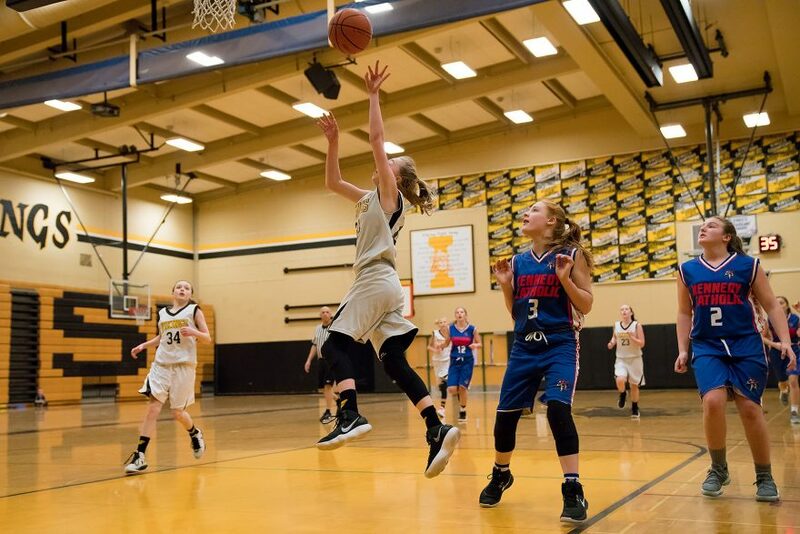 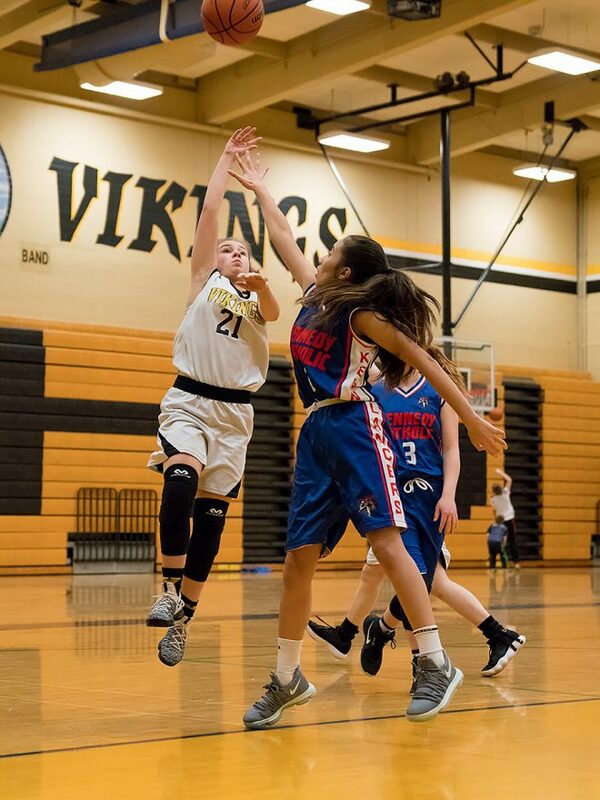 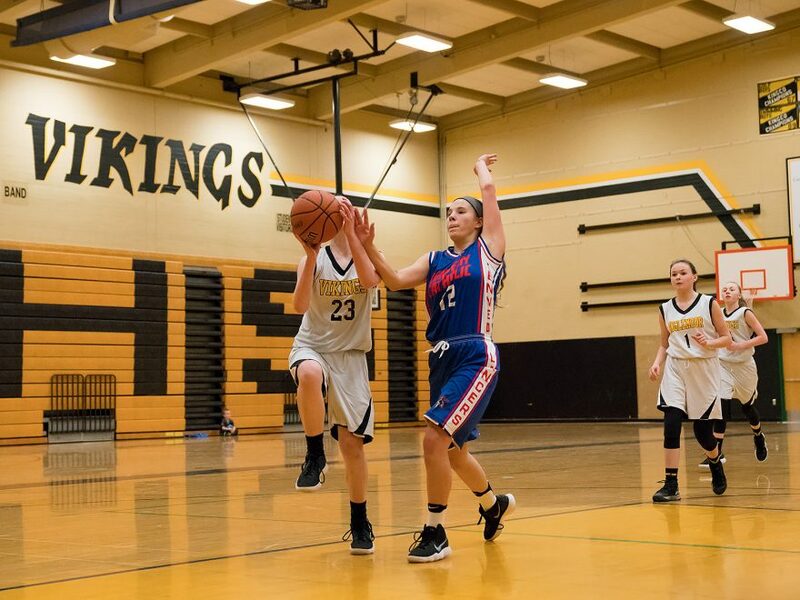 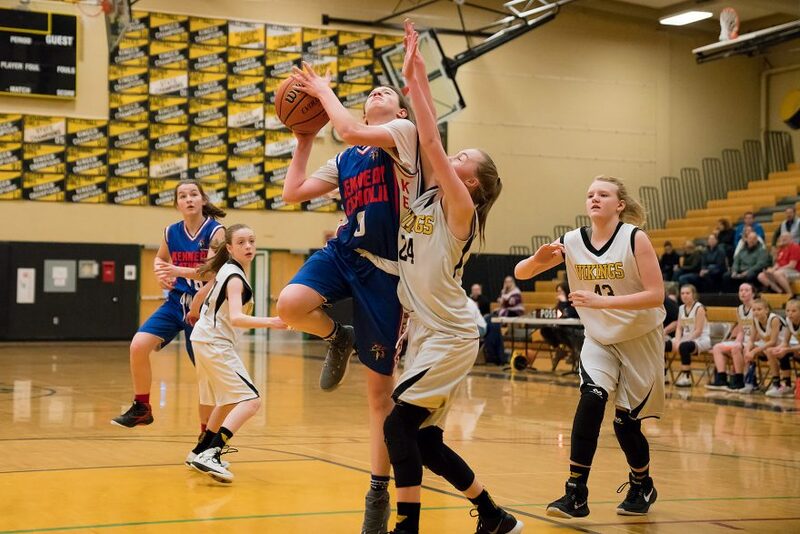 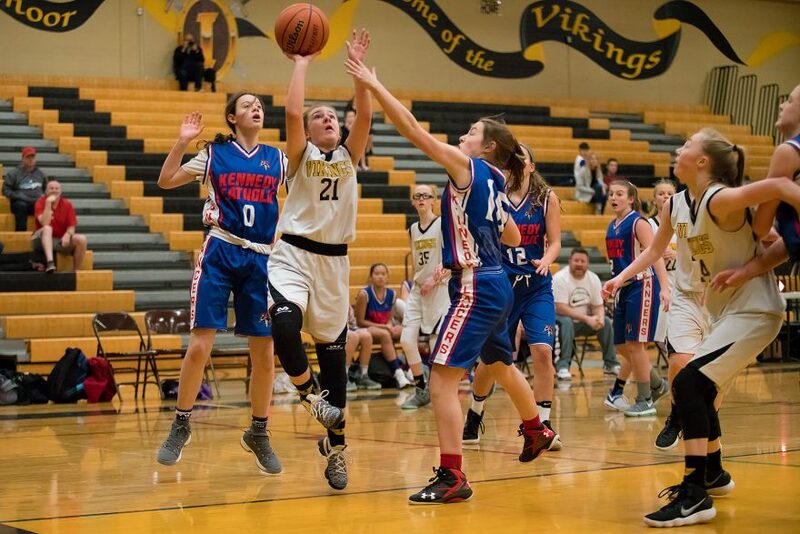 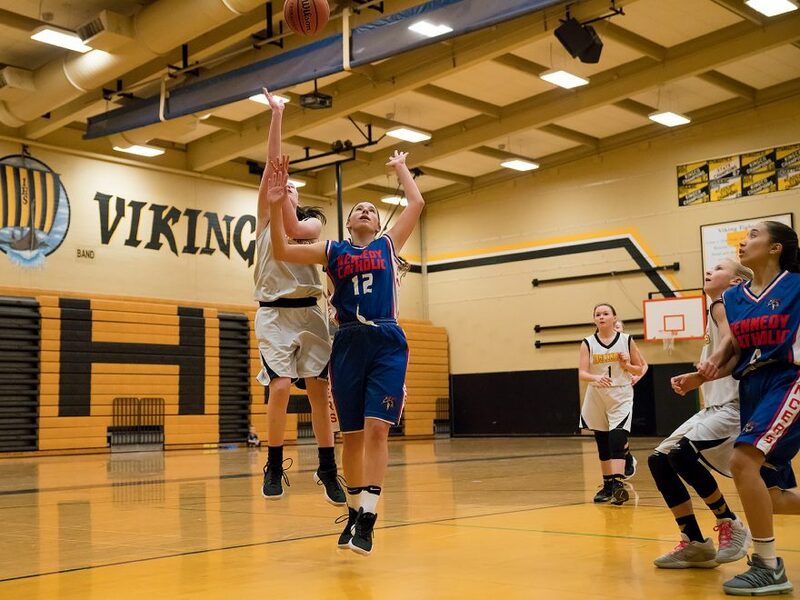 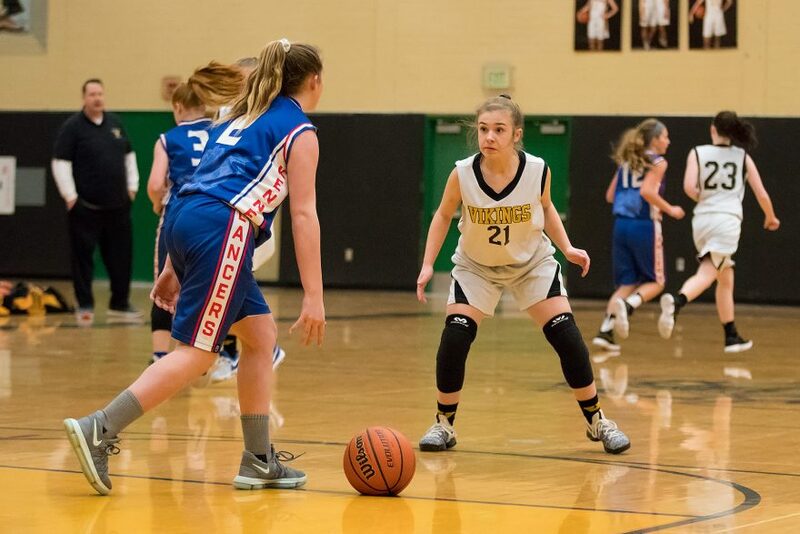 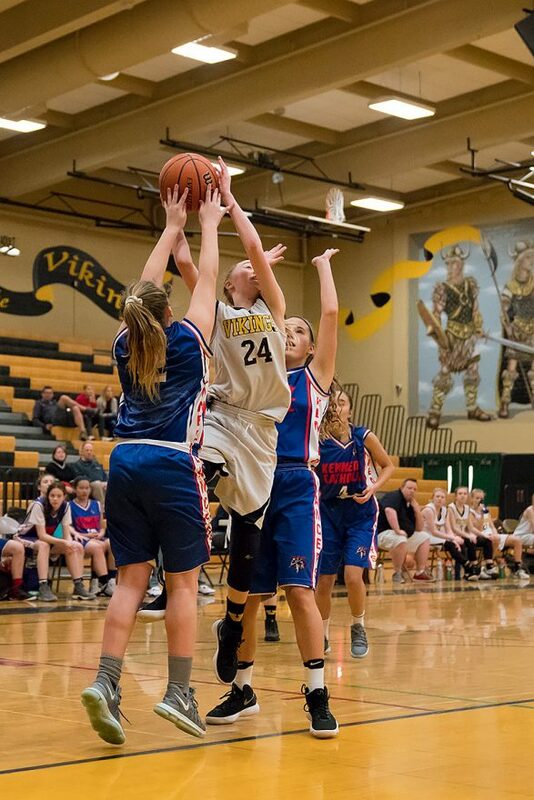 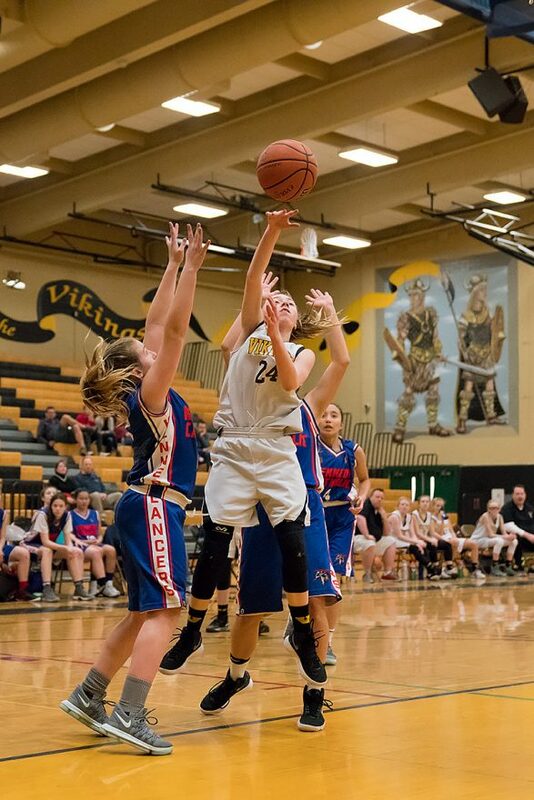 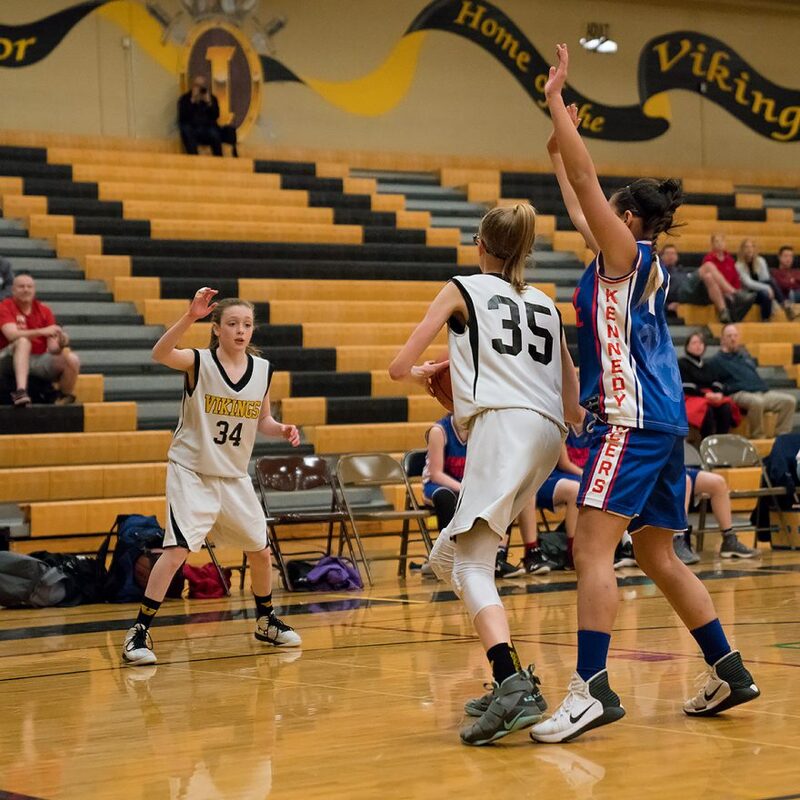 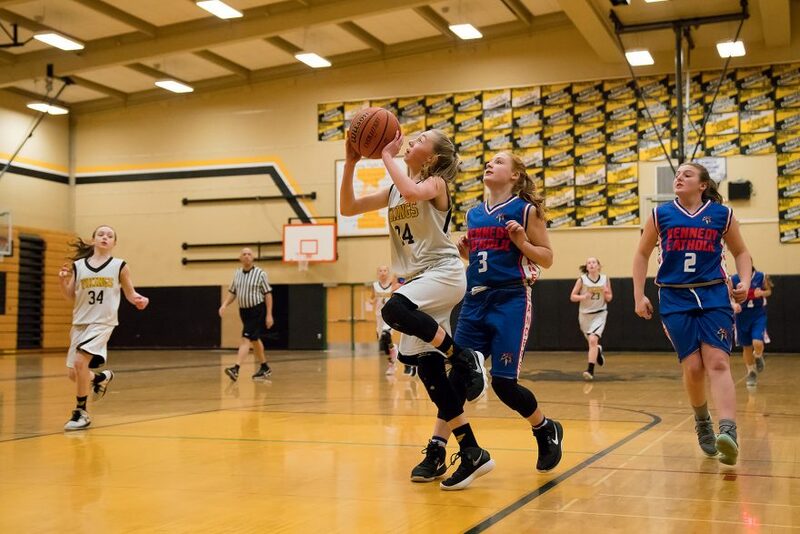 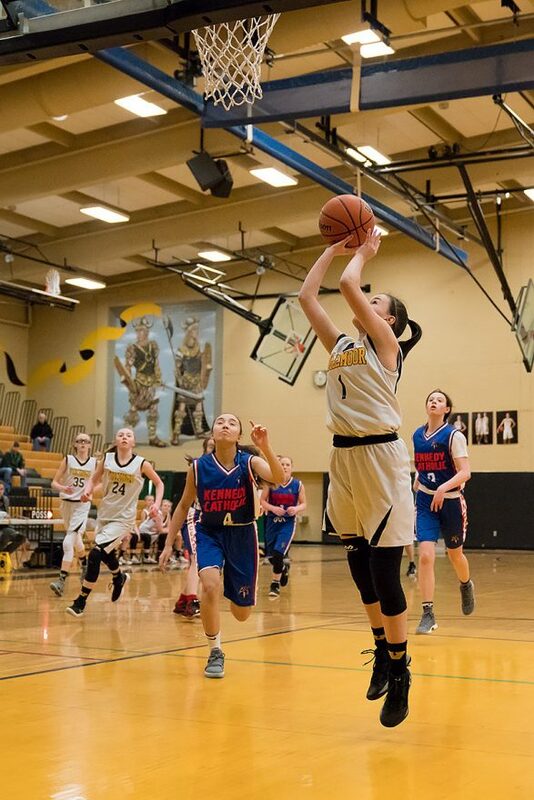 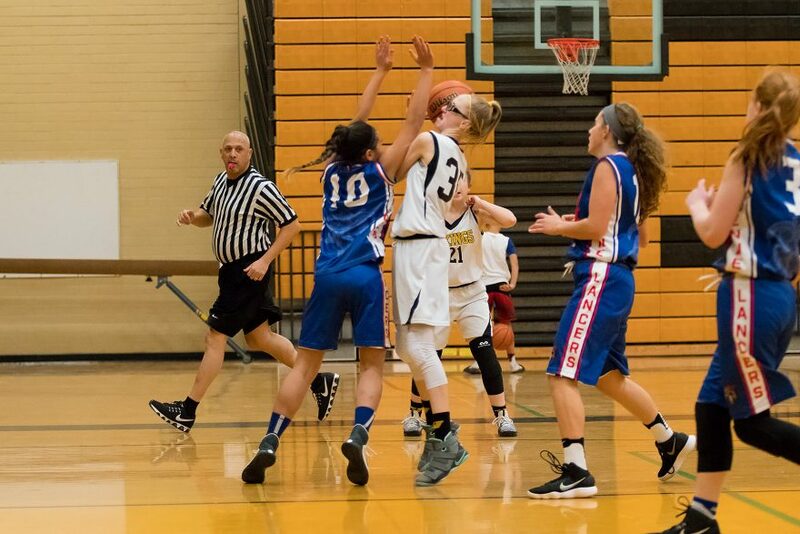 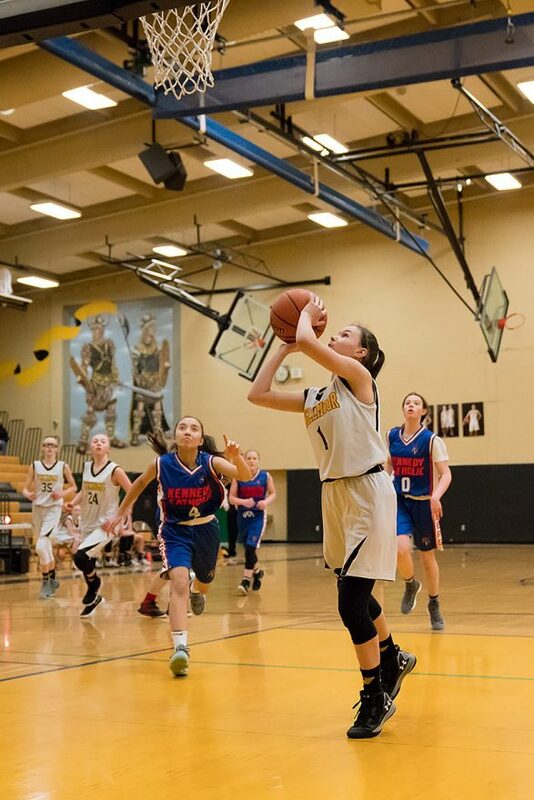 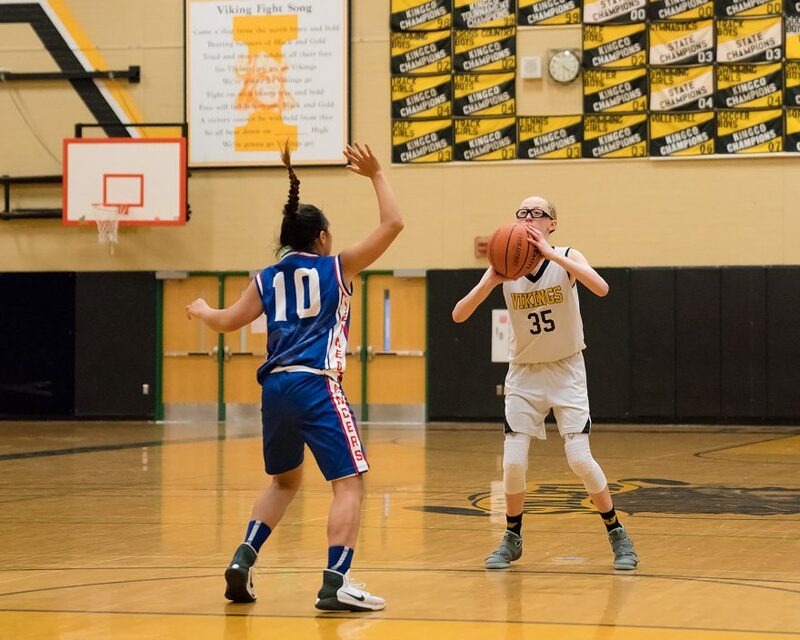 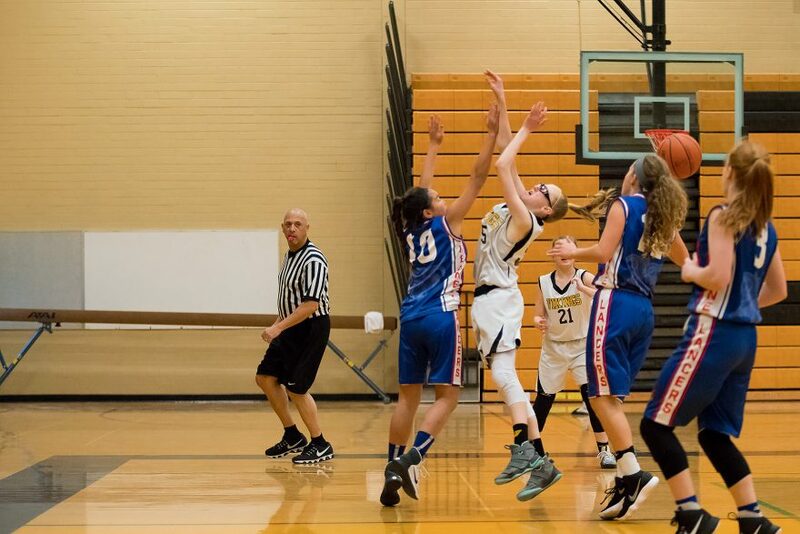 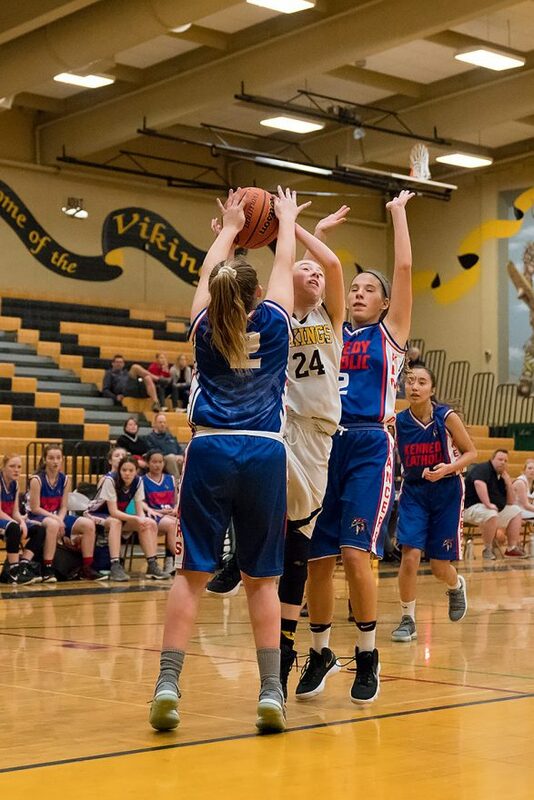 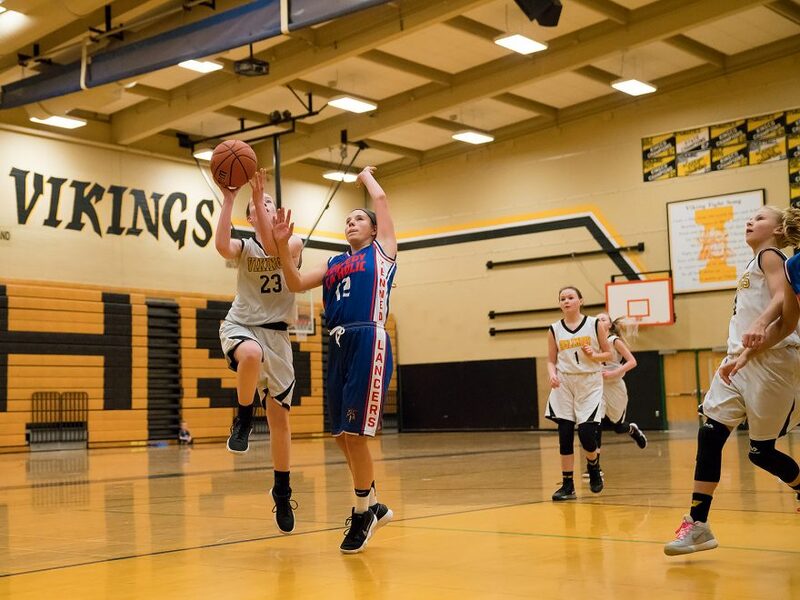 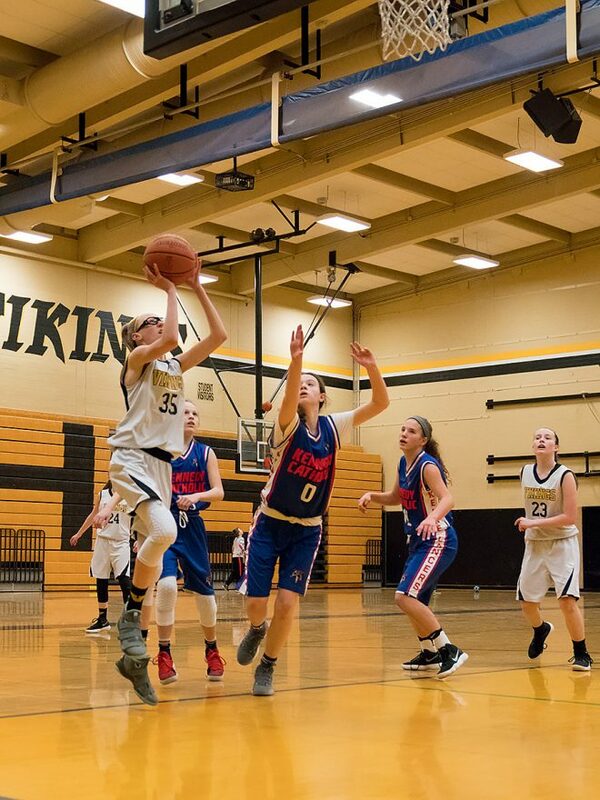 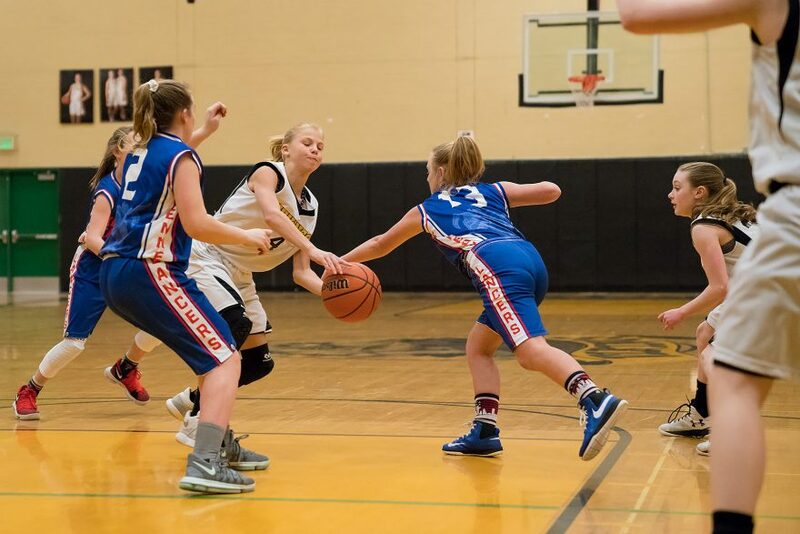 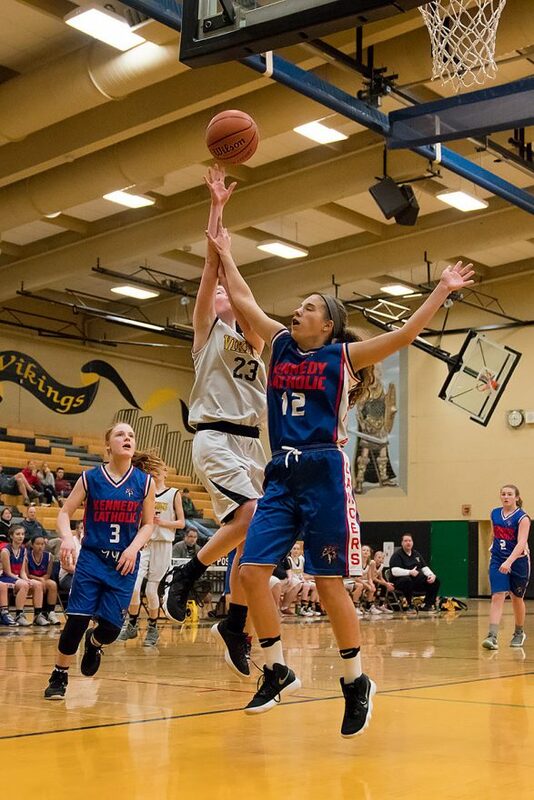 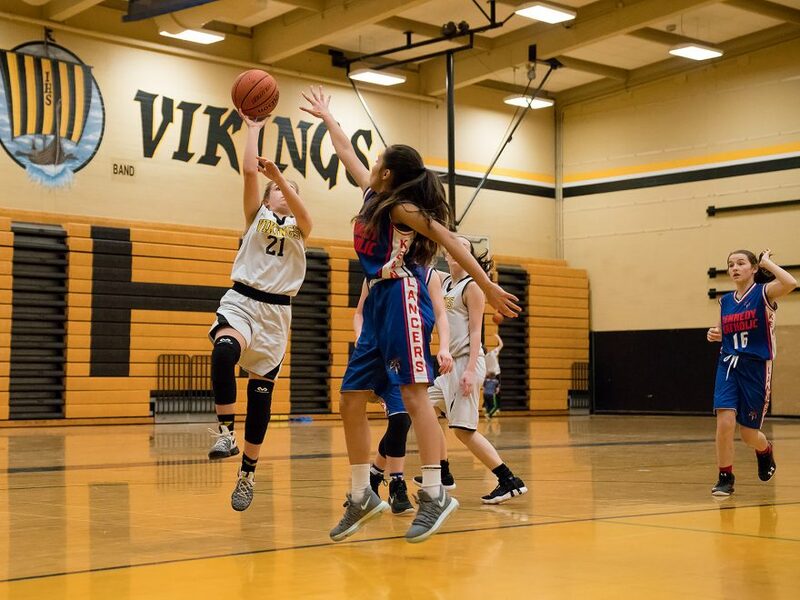 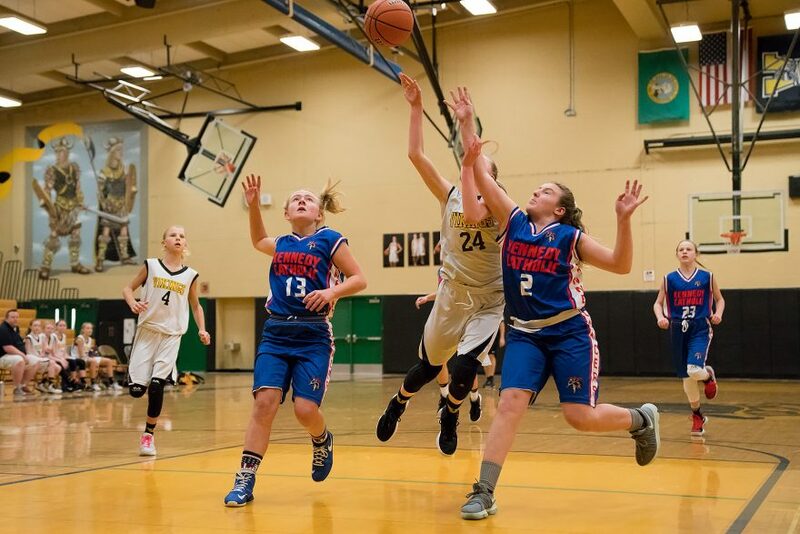 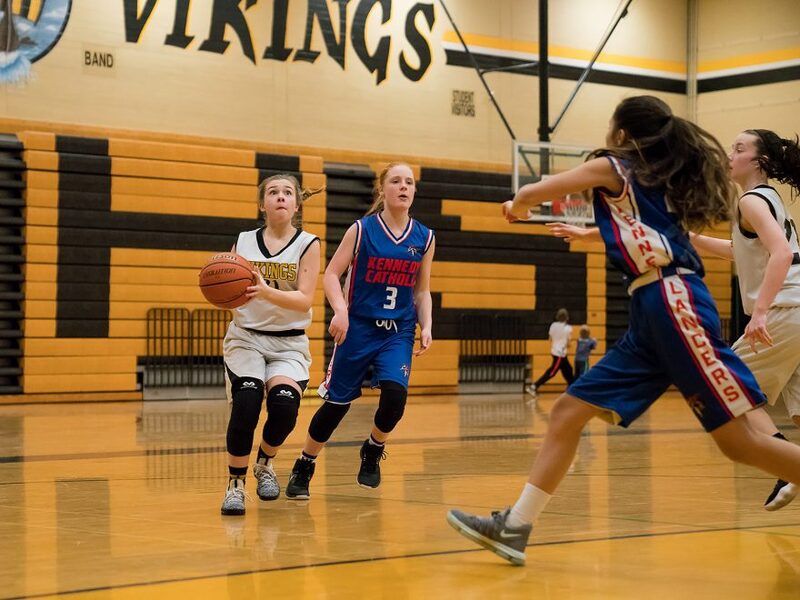 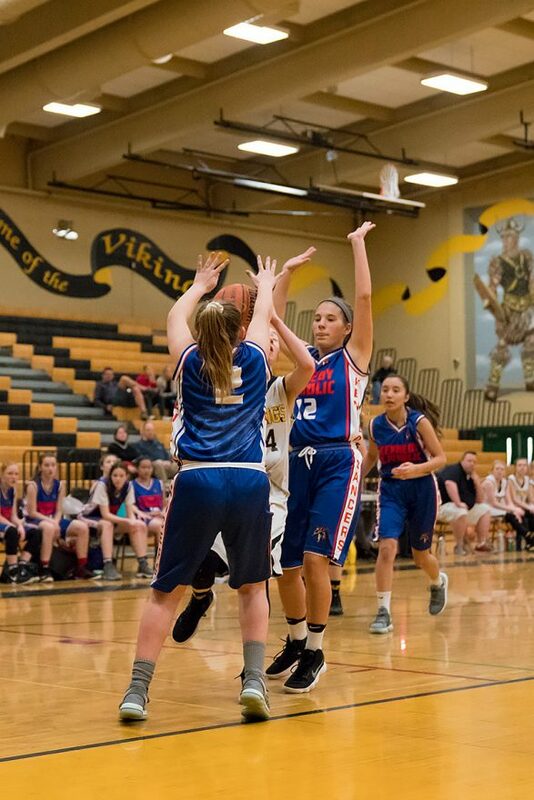 With less than two minutes left in the third quarter, #23 fought her way to the rim and lifted in the ball for the Viking’s first lead of the game (24-26). 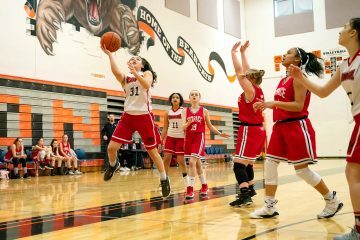 Having fallen behind, Kennedy Catholic grew increasingly physical on defense, and the officials were not able to keep up. 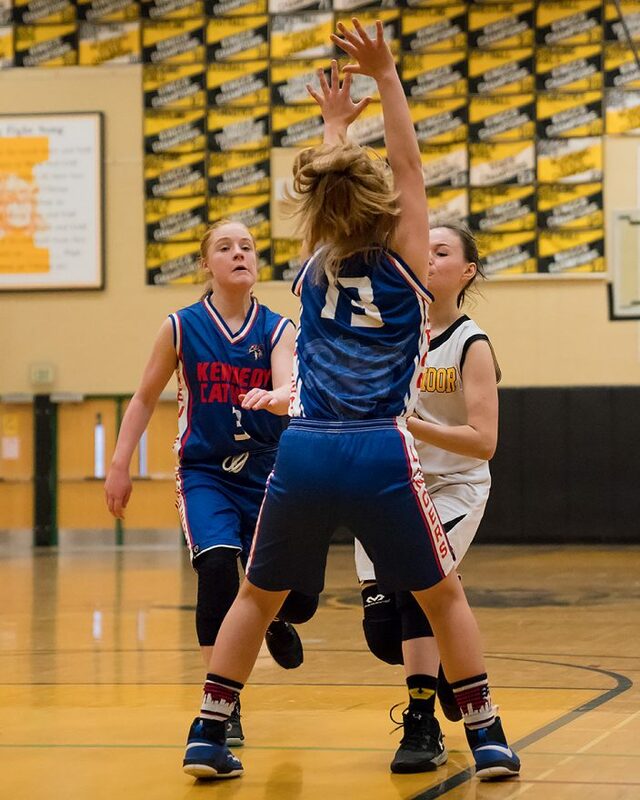 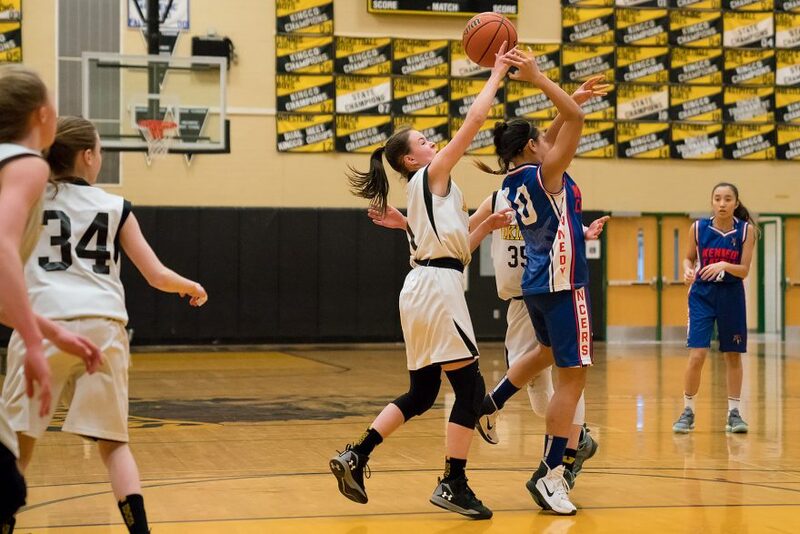 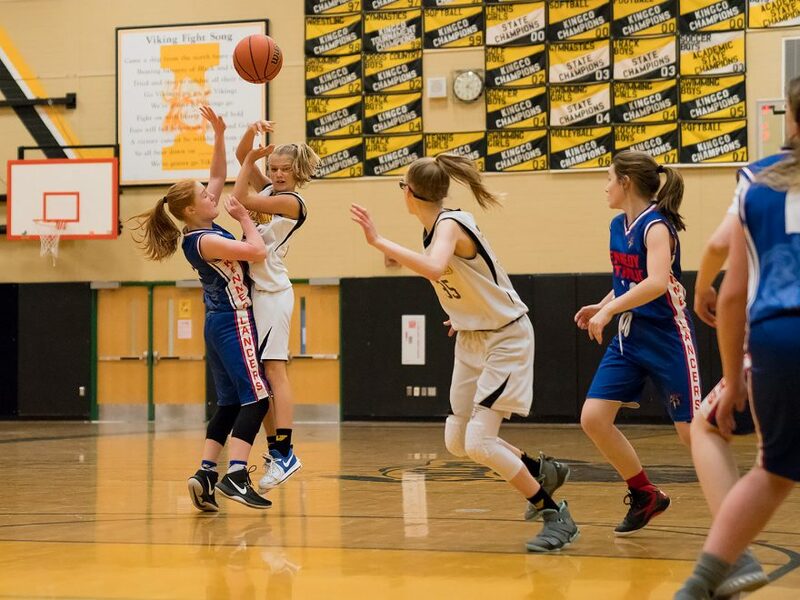 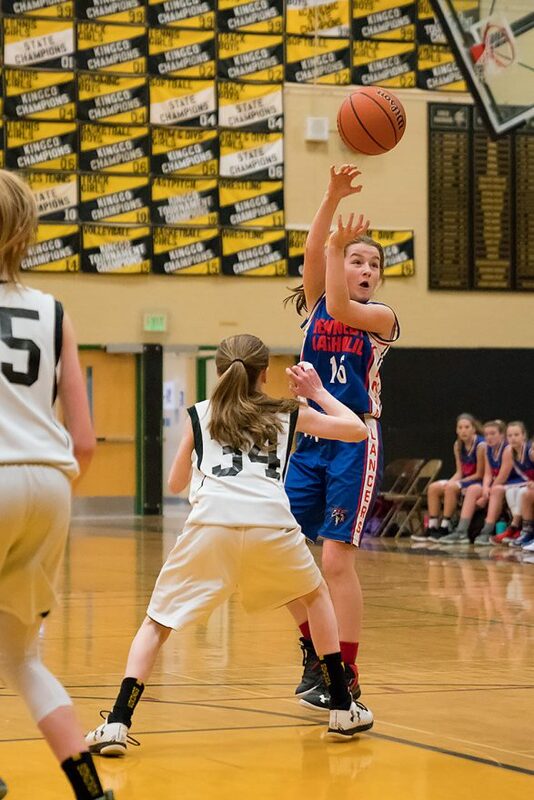 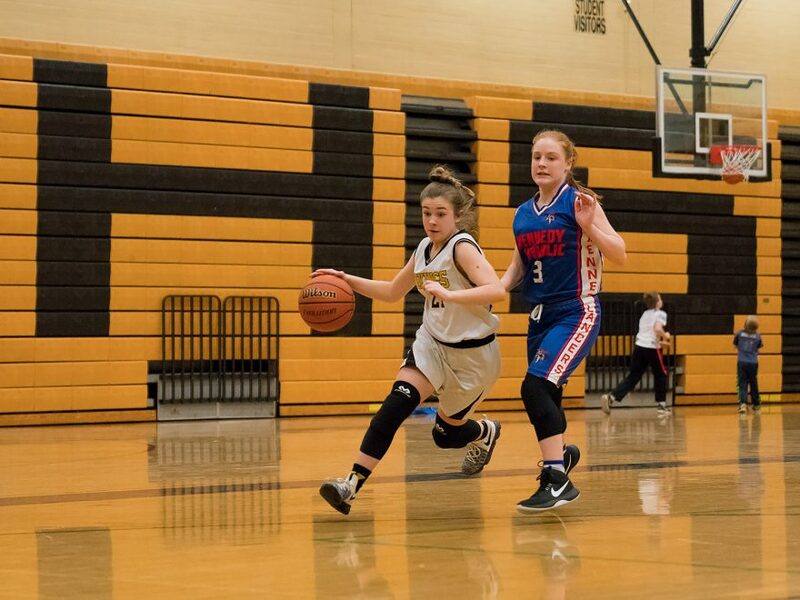 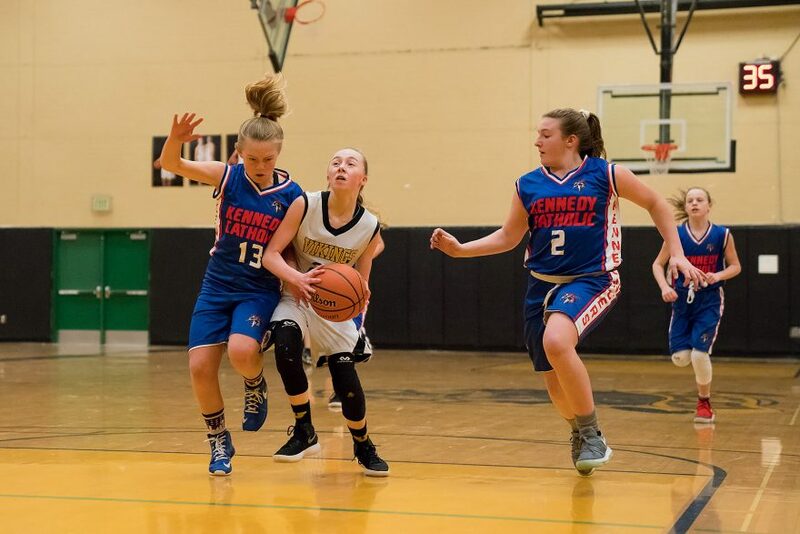 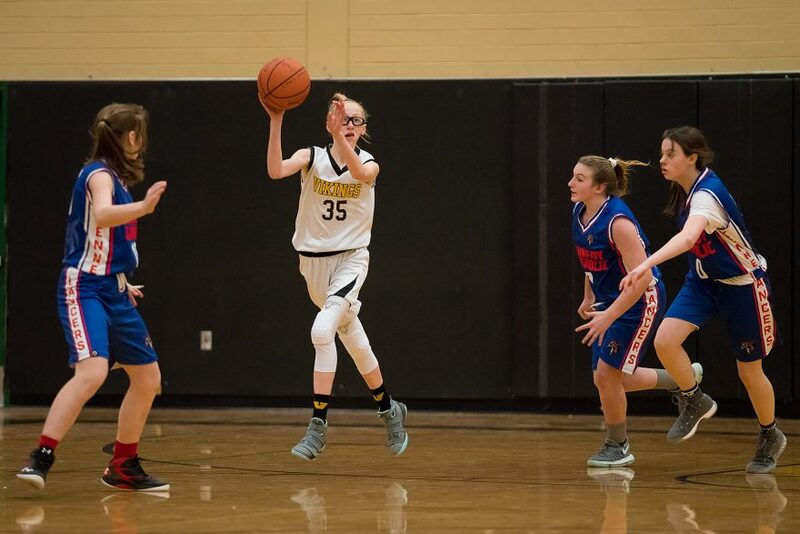 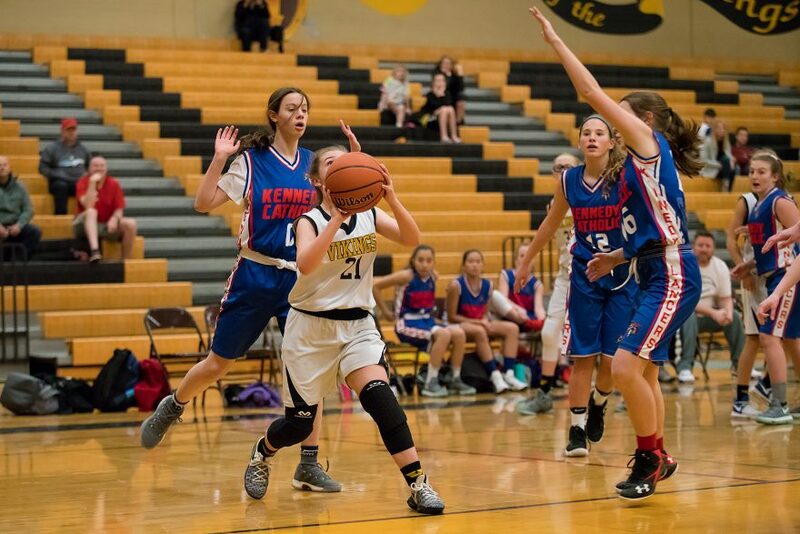 In following two minutes, #4 and then #35 were both hacked on their way to the basket, but the whistles remained silent, and Kennedy crept ahead, 27-26 and then 30-26. 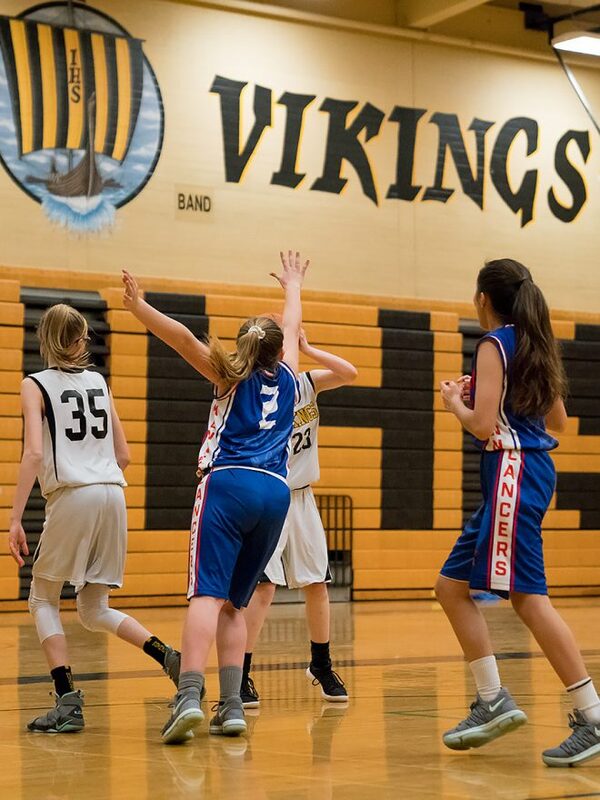 But a long jump shot by the Vikings closed the gap to two points, and then #24 sailed over her defenders in the paint to tie the game, 30-30 with five minutes remaining.